To understand the current issues with Thameslink, one has to understand its past. In this series, we explore the history of London’s only ‘through’ line and how that influences today. For many years it has been the Holy Grail of urban rail systems to have railway lines starting on one side of a city and emerge on the other side. It wasn’t always this way. In the days of steam, going underneath a city (and having underground stations at all) was generally thought to be impractical. Indeed for some time only London was bold enough, or mad enough, to do such a thing on a serious scale. Even then the heart of the city wasn’t really penetrated, with a single exception – one that would ultimately make Thameslink possible. Paris waited until electric traction became available, pioneered in London of course, before it was prepared to embark on building the extensive Métro and its multitude of individual suburbs-centre-suburbs lines. Vienna did have a steam-operated underground section of line for a short while, but was quick to convert it to electricity once that became an option. Today, worldwide but especially in Europe, the situation has changed completely, as major urban conurbations realise the benefit of through cross-city services. There is an ongoing trend to get rid of (or at least reduce the size of) termini and, in so doing, create more through journey opportunities. Alternatively, an original terminus might be replaced with a through station, such as happened at Birmingham Moor Street or, on a much more dramatic scale, in Vienna, Madrid or Berlin. French-style RERs remain an option for providing cross-city links, but mostly involve large-scale main line sized tunnels costing billions, as seen in Berlin, Madrid and, of course, Paris. One could put Crossrail into this category as well, but that also has a strong element of providing service entirely within the central area – much more so than Thameslink. As well as reducing, or eliminating, capacity issues and operating challenges at termini, through services mean better utilisation of rolling stock. Whilst building an entirely new line is, in railway operating terms, relatively simple to introduce, joining two existing lines at opposite sides of a city and smoothly integrating them into the existing railway system presents far more of a challenge. Such joining together is not entirely new in Britain. Nor is it limited to London. There are cases where services that used to terminate at a central station are joined together to create a through train service (such as Merthyr Tydfil – Bridgend via Cardiff, or Barnstaple – Exmouth via Exeter). In Liverpool we have the link and the loop line on MerseyRail and in Scotland there is the re-opened Argyle Line in Glasgow. Manchester now has the potential to benefit from through services as the Ordsall Chord has recently been opened and is used by trains to link north and south Manchester. Unfortunately, the recent experience of Northern commuters has re-enforced the view that joining two previously unconnected services does not always proceed smoothly. In London, sentimentalists may mourn the loss of Broad Street terminus, but its abandonment has made possible a cross-London service of sorts on the London Overground (currently 16tph but this should go up to 20tph in the next few years). However, this does not quite fit our criteria. It doesn’t quite go through what is generally regarded as the city centre and there was no existing service on the north side to link up to. Although it utilised abandoned railway infrastructure, in operating terms, the extension of the East London line northward was effectively an extension of a dead-end branch line. Another example in south London that doesn’t quite qualify is the combining of the Wimbledon – West Croydon rail service with part of a line terminating at Elmers End. This created a through service via Croydon town centre. In this particular case, the objective is the same but is achieved by converting under-utilised rail lines into tram lines and creating a new cross-town link using existing streets. The complexity of fitting the new service in with existing services was avoided, because there are no other tram services it needs to be integrated with – and in any case the situation with trams, which are generally driven on line of sight, is much simpler. As early as 1866, just three years after the Metropolitan Railway opened the first passenger underground railway in the world, the London, Chatham and Dover Railway built a line northward from today’s Blackfriars. This joined up with the Metropolitan Railway’s widened lines at Farringdon (then Farringdon Street). Despite not being its primary purpose, the route was a busy passenger corridor until trams were electrified and provided stiff competition. However the passenger services were mainly about accessing the City, with a triangle built to reach Moorgate. During World War 1 the passenger service was stopped as a temporary wartime measure, as was the case with many railway lines. Here, it was probably more due to a desire to maximise freight running, rather than as an economy measure. Whatever the initial reason, it would be more than 70 years before passenger services resumed. The route was abandoned as a freight route in 1969. At the time when the Snow Hill tunnel through central London was abandoned, the railways in Britain comprised of various regions which reported to the British Railways Board. All railway employees worked for the nationalised industry – except, slightly paradoxically, the members of the British Railways Board, who were employed by the Ministry of Transport. All the English railway regions had termini in London. These regions were well-known for acting independently from each other and co-operation was minimal. Although it was arguable that the situation should not have been allowed to develop the way it did, there was some logic behind keeping it that way. Traction systems on different regions were quite different and generally incompatible. Western Region was entirely diesel. Third rail was originally only found south of the River Thames. Electrification north of the Thames was generally overhead electrification at 25kV but there were pockets of fourth rail electrification – eventually changed to third rail. Possibly more relevant to current events, creating a workable national timetable was incredibly complicated. In those pre-computer days, it probably made sense to construct timetables at regional level with a minimum of interface necessary for various inter-regional trains that, on the passenger side, were few and far between. On Southern Region timetabling generally went down to divisional level – there were three divisions in Southern Region. Central headquarters would be responsible for co-ordinating publication of the national timetable, and resolving any inter-regional disputes that there may be but, in broad terms, the regions wrote their own timetables and operated them. As there were then no computers suited to the task, a significant amount of manual effort was involved in creating the Great Britain National Timetable each year. This had to be printed and distributed in good time for the main annual timetable change. Because of this, the exact times of trains were pretty much fixed months in advance. Roster clerks and depot managers would have a number of months available to prepare for the change. They would know, for example, the exact timing of trains, when they were due to leave the depot and exactly when they could reasonably expect them to be back in the depot. It is worth noting that the main timetable change was in May then, as opposed to December now. This was later moved to December to coincide with the common change date in Europe because at that point timetable changes impacted on Eurostar and hence the French national timetable. Once HS1 was fully open, the need to align with Europe over this matter diminished and we seem to be heading towards a situation, not entirely by design, where May is becoming the main annual timetable change date once again. In 1982 the management structure of British Rail shifted from the regions to ‘sectors’. The London and South East sector was born as part of British Rail’s ‘sectorisation’. It was clear that one of their objectives was to break down the regional barriers. Although the regions still existed their role was now to provide services to the sectors, who paid them for their services. In other words, the regions no longer called the shots. In 1986 the sector was marketed under the name it is generally remembered as – Network SouthEast. An obvious way of breaking down the regional barriers and of displaying Network Southeast as an entity, was to re-open the abandoned Snow Hill tunnel and extend the proposed Bedford-St Pancras electric service to Blackfriars via Farringdon over the reinstated track. From there it could continue via either London Bridge or Elephant & Castle and, in so doing, take over some existing Southern Region services – by now rebranded as a Network SouthEast service of course. There would be the challenge of the trains needing dual traction (pantograph and third rail pick-up shoe) but traction technology had reached the stage where this was considered do-able, even though it had never before been attempted on British Rail on such a scale with full integration with other services – though since 1976 the Moorgate service used dual-voltage trains over the short section from Drayton Park to Moorgate but at restricted speed when on third rail. It was fortunate in that Thatcherite era that the Treasury approved of the scheme. This was partly because of the efficiencies achieved by avoiding layover of trains at termini. In truth though it was also because it reputedly only cost £4 million to implement – a relatively tiny sum of money even in those days. This small sum of money needed to create Thameslink did not include the cost of new dual-voltage rolling stock but most of that cost of this would have been necessary anyway for replacing old stock on other lines – something that could now be done by utilising the displaced Class 317s which would be replaced by the new Thameslink class 319s. So, for the most part, rolling-stock cost did not feature in Treasury calculations for reopening the line. It is hard to establish exactly who contributed what to the project in financial terms, but it seems that the Treasury paid for the line to be reinstated so that trains could run from Blackfriars to Farringdon and rolling stock utilisation could be improved. In addition, the GLC contributed £1.4 million. This appears to have been for additional passenger benefits and may have included money towards preparing for a new City (then St Paul’s) Thameslink station. Despite this, the GLC always appeared to claim credit for the whole scheme. It seems that no consideration was given by the Treasury to any passenger benefit of the scheme when considering its merits. Introduction was initially very low-key, and that may have been wise with a generally anti-railway prime minister. This was a common railway tactic of the era – to get projects approved ‘under the radar’ and not attract too much attention in government circles. Indeed government involvement in actually introducing the scheme was non-existent. Their only job was to authorise it and provide the money to enable it to happen. Once the scheme was authorised, the government did not want to get involved and was happy to leave British Rail to get on with it. This did leave everyone in no doubt from the outset that, if things went wrong, Network Southeast would have no-one to blame but themselves. The original Thameslink scheme may have been built on the cheap, but it worked. Any issues of serving London Bridge station in peak hours were resolved simply by… well.. not serving London Bridge station in peak hours (except for a 1tph token service). The original service was a mere 4tph for most of the day but 6tph for a one hour peak. Initially there could be an awful lot of recovery time built into the service through the central section. This considerably simplified the timetable challenge and help ensure that trains were handed over on time when joining an existing network. When it came to integrating with existing services it was a different world then. South of the river, the Thameslink trains using a third rail pick-up had similar characteristics to the existing third rail stock on Network Southeast. As existing train paths were being re-purposed, rather than any new ones created, there was not a capacity issue. North of the river, things were also very different then. Despite both Thameslink services to Blackfriars and a residual service to Moorgate, the Midland Main Line into St Pancras was not exactly taxed, capacity-wise. Initially, with loco-hauled Inter-City trains limited to 100 mph and four tracks between London and Bedford, the 100mph Thameslink class 319 electric trains that used the fast lines could hold their own against the the other services they had to integrate with. Integrating 6tph, later 8tph, into the Midland Main Line would not have been challenging. Even the introduction of the HST on the Midland Main Line did not change things significantly, as line speeds limited them to 100 mph. This may well have been influenced by the agreed maximum speeds that could be in operation on single-driver trains. It was not until 1988 that HST’s were used here to their full potential. The rewrite of the timetable was assisted by the ability of the Thameslink trains to accelerate quickly compared to their diesel predecessors. Thameslink wasn’t the problem – it was the solution. The necessary route learning for drivers – one of the biggest problems today – must have been absolutely minimal. The distance between Farringdon and Blackfriars was just less than one kilometre. So, in principle, a driver from north of the river who had additionally learnt that short section of route could take the train as far as Blackfriars where a driver from south of the river with suitable route knowledge could take over and drive the train to its destination. In practice, a single Thameslink driver took the train over the whole route and, in doing so, avoided the complexity of having drivers changing mid-journey. In those days there were generally sufficient available drivers for training, drivers were more willing to work overtime and regulations concerning drivers hours were less strict. One of the first three routes was a limited stop service from Bedford to replace a similar service that was well-established. It seemed logical to combine this service with a similar service from south of the river and so a Bedford-Brighton service was born. In doing so, this firmly established Thameslink as, at least partially, being about running longer distance trains rather than the more usual suburban services that normally operate through central tunnels under cities. The mix of longer-distance and suburban services (and city centre services similar to the Underground) was going to create challenges in future. And any future rolling stock was inevitably going to be a compromise. As plans progressed for a future enhanced service preference seemed to given to longer distance routes based on the concept of the Bedford-Brighton service. The preference for Thameslink joining together routes that serve towns and cities a considerable distance from London will lead to a strange situation at London Bridge for those trains that have come up the Brighton Main Line. Most longer-distance trains will be through trains and all suburban services will terminate there – a reversal of conventional wisdom. This must be partly brought about by the fact that 12-car trains can be used on the longer routes but suburban routes on Southern are generally restricted to 8-car or 10-car trains. With capacity becoming the big issue driving the present-day scheme (it wasn’t originally) this is a very significant consideration. We will not go into details here of the history of the development of the Thameslink Programme, as we have covered it many times before, but suffice to say it seemed that to try to run more and longer Thameslink trains was a good idea that had plenty of potential. Furthermore, an enhanced scheme could have significant effect on providing the extra capacity much needed on train services in London. The result was the Thameslink Programme – a much delayed and enhanced version of an earlier Thameslink 2000 scheme. In very simple terms there was a construction phase and an implementation phase. The construction phase is now largely complete apart from some signalling enhancements and we are now into the implementation phase. A critical risk was that, during the construction phase, a challenging timetable would have to be introduced. Having taken a look at how it was relatively simple to implement the original Thameslink scheme we now take a very brief look at the Thameslink service pattern during the present project’s construction phase. Thameslink trains not being able to travel via London Bridge at any time of day. The final constraint meant that, in order to maintain any kind of meaningful service to Blackfriars, more trains had to travel through the Thameslink core. This led to a 15tph peak-period Thameslink service through central London terminating at various locations on on the Midland Main Line (generally Kentish Town, St Albans City, Luton and Bedford). Whilst rail travellers probably do not have fond memories of this period, and the many problems that developed during it, as far as the Thameslink timetable is concerned, it was fundamentally sound. In a way, the fact that timetable worked is quite remarkable. The ultimate intension is to have 16tph Thameslink trains going to various destinations on the Midland Main Line and yet for the past few years there has already been 15tph using older, less-suitable rolling stock rather than the modern class 700 trains specifically designed with the Thameslink route in mind. In part 2 we will look at how the new Thameslink service went horribly wrong. I’m told that in the bad/good old days, the most important sation in Britain, as regards timetables was …. Lichfield – And, not Brum New Street, btw. I think that, even so the reconstruction of the “slink” is sub-optimal – we’ve previously mentioned the presence of only 2 southbound platforms at St P ( Cost & possible undergound barrier constraints) & the second probable mistake is that “Wilberforce Junction” is a flat crossing, not flying, though where & how one would insert such a thing, given the physical constraints is a different question. And there is the layout a Blackfriars, too. Very interesting, thanks. I remember the start of Thameslink services as I working in Holborn Circus at the time. I can verify the fact that the whole inception of this service was very low key. The barest of information was supplied at station notice boards and when it did start there was hardly any mention of it. But as you clearly state, the new Thameslink service actually worked from the off, and I cannot remember any problems with it at all from day one. This contrasts immensely with the current state of the Thameslink service. I just think it is hugely ironic (and perhaps perverse) that the origins of the Thameslink service had such a modest initial budget, yet the latest incarnation has cost an incredible amount of money. Look forward to reading Part 2! It is true that in 1979 the station (then called King’s Cross Metropolitan) was closed as part of the Great Northern Electrification Project. However, it was reopened in 1983 renamed King’s Cross Midland City as part of the Midland City line electrification project. As far as I can discover the station did not close when additional services, which were were added Thameslink added (to the existing Moorgate services). However, in 1988 the station was again renamed to be King’s Cross Thameslink. Therefore, the only difference in 1988 was extending the opening hours to all-day from only peak-hours. Wasn’t there the precedent of the dual voltage Great Northern trains which had started working to Moorgate via Old Street a few years before? Reopening King’s Cross Thameslink – this didn’t need reopening as trains already operated to Moorgate on the Widened Lines (known at the time as the Midland City line). Kings Cross Midland City, as it was then known, was rebuilt in the early 1980s (with the “SMILE” tunnel added to link into the tube station). It was just renamed for Thameslink. In the late 1980s an overall roof was also added (replacing one that had been destroyed in the war?) over part of the platforms but I don’t think that either this, or the construction of City Thameslink, were part of the original low-key scheme (Thameslink services ran over the Ludgate Hill bridge and past the platform ends of Holborn Viaduct for a few years before the line was sunk). All typical of the way that a series of not completely planned or coordinated evolutionary steps lead to what we have today. @Peter: you got in before me on Kings Cross! But I thought that the Midland electrification included all day services to Moorgate? On the other hand one of the problems in the 1987 Kings Cross fire was that the exit to the Midland City station was locked and neither the Underground staff nor the fire brigade had the key. “Proposed Bedford-St Pancras service” in the section on Network SouthEast is somewhat misleading. The service was started by BR several years before Sectorisation (1983 according to Wikipedia but I can’t confirm that personally). “Thameslink Class 317” is also misleading. Class 317 where the original 25kV-only units introduced for the Bedford electrification, transferred to other lines and replaced by dual-voltage class 319s under the Thameslink project. The only involvement of Thameslink with class 317 was when a few were borrowed back for a while to operate peak-hour services to Moorgate. Network South East was ‘created’ in 1986, not 1982; indeed it has its 32nd birthday this coming Sunday. It was a relatively small operation, mostly for service planning, marketing and branding; the regions still ran the services until 1992. 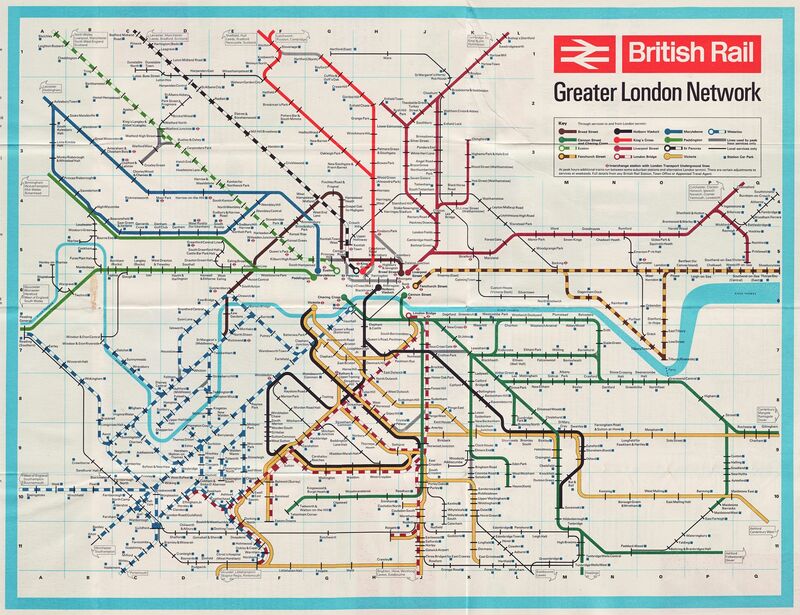 The 1982 version was the London & South East sector. The original Thameslink project was indeed based on rolling stock efficiencies. The infrastructure work was £1.4m (and didn’t include St Paul’s / City Thameslink station, which was a seperate, later, and much more expensive project), but it was part funded by the GLC. The total cost of the scheme was well over £50m, almost all of which paid for the first batch of 46 Class 319s. These displaced many units both north and south, which were either cascaded to other lines (notably the ‘BedPan’ units on the Midland Line, which mostly went to Euston) or scrapped. The initial service through the core was 4tph; 2 of which went to Gatwick. A fifth service was added relatively quickly, and one of the Gatwick’s extended to Brighton. However, although the Midland Main Line was a much emptier railway back then, there was still a regular suburban and outer suburban service to St Pancras (old high level station) and Moorgate, particularly in the peaks. The 1989 timetable shows a relatively busy morning peak – at least 12tph in the high peak hour for what we now call Thameslink services. Assuming Wiki is correct it seems Thameslink services started in May 1988 – so 30 years ago. What a way to celebrate being 30 – destroy the service back to levels last enjoyed in 1988. Just looking at my photos on Flickr I have shots of class 319s in St Pancras and at Brighton but they seem to date from 1987 (I was never brilliant at recording dates for film photos). I assume one of our resident experts can confirm the 319s were brought into use north and south of the Thames before through running commenced via the Snow Hill tunnel. There is something sad that a very simple, cheap yet effective BR scheme grew to be hugely successful and when we’re at the point of realising what should be a big step forward with new trains and infrastructure it collapses into an enormous heap. One wonders what Chris Green must be thinking watching from wherever he is enjoying his retirement. WW: It’s the Pareto principle. We got 80% of the Thameslink benefit by spending (rather less than) 20% of the final bill. Perhaps we should have stopped there. – I have removed the reference to King’s Cross Thameslink. I had completely forgotten it was already reopened under another name. – I have corrected the reference to the start of Network South East rather than the London and South East sector. In my defence many books are rather lax in making the distinction. – I have corrected the reference to first use of dual-voltage. As pointed out it was not first – but it was the first to implement it integrated with other services at full line speed. True it had been used on the Moorgate services a few years earlier but I think the line speed when using third rail was limited to 30mph. – I cannot recall any reference to 4tph initial service. It may have built up to 6tph from 4tph but Chris Green’s ‘Network SouthEast’ book shows a pamphlet with three routes and the pamphlet is titled ‘A Brand New Service Right Through The Heart of London’. The book also refers to 6tph in the peak hour suggesting that maybe it was only 4tph off-peak. – I have made it clear that the cost of new rolling stock was extra but this was effectively a nil additional cost since new stock was needed elsewhere any way and a bit of stock reshuffling ensured that Thameslink had the new stock. – I have subtly changed the title from Holy Grails and Thameslink Fails: A Brief History of Thameslink (Part 1) to Holy Grails and Thameslink Fails (Part 1): A Brief History of Thameslink which is closer to its original title. This is just to be clear that this isn’t about a history of Thameslink throughout its existence. It is going to compare the original project with the current one which most of you appear to have already grasped. It is now. Seriously, it already was in part 2 but your description is so much better so we will use your description. Unfortunately part 2 is currently a bit of a moving target with more information coming to light day-by-day. Oh how you do love to raise the same points time and time again. St Pancras. As recently explained by Sad Fat Dad elsewhere, making St Pancras box bigger would have been a huge technical challenge. It might be better but, at the end of the day, you still have two tracks southward so does nothing for capacity. So almost certainly bad value for money – if it were possible. Wilberforce Junction. It was explained in detail by someone clearly in the know that this absolutely was not possible. Even with the current service, Blackfriars is probably optimal for reducing conflict. Could do with extra terminating platforms though but that appears to be lost. You have to bear in mind Blackfriars was designed with 18tph going to London Bridge and Sutton services terminating there. If politicians decide, after the station is built, to impose route constraints that may have affected the layout then there is not much you can do. So yes, the layout at various locations on Thameslink is sub-option if you are not constrained by reality but that is true of any just about railway in the world. In any case, your comments weren’t really about the History of Thameslink which is what this is about. On the subject of who paid what for the scheme I really am still none the wiser. Various sources are adamant that the Treasury paid for the cost of the scheme based on savings on rolling stock utilisation. This makes it hard to see what the GLC contribution was for. But, at the time and after, the GLC seemed to suggest that they contributed the money that made the reopening possible. I have changed the text to make it clear that what is now City Thameslink was not opened at the time the link was opened. It must have been in planning though because the station was opened a few years later. It is true the cost was considerable but, as this station was not crucial to the re-opening of the line, this would not have influenced the original decision to re-open the line – other than possibly to be regarded as a possible future benefit. Historical note: The “old” KGX Thameslink station was, of course the “other half” of the old Met/Circle original King’s Cross “SSL” station, the southern pair of platforms closing when the “new” King’s Cross Circle station opened in 1941. But, up until (?) 1977 (?) one saw the incongrous sight of, from the ex-GN lines, of a Brush type 2 diesel hauling ancient compartment stock in to Moorgate. The platforms were definitely crowded when those trains arrived. It was even more “fun” up until about 1961, when the same trains were hauled by ex-GNR class N2 0-6-2T locos – it gave one a glimpse of what the steam-hauled “circle” must have been like. Agree on virtually all points with SFD, my understanding was that the GLC paid the £1.4m for the limited infra work completed 1986 but not opened for traffic till early 87) and HMT picked up the rest of the £52m for the stock some of which was delivered for the launch in April 1988. 313s – The speed limit in the Moorgate City and North London line Tunnels is 30mph for non electrification reasons. The St Pauls / City Thameslink scheme (£50m) should be handled separately in discussions as is effectively Thameslink Phase 2 and aligned with pressure from the Corporation of London to redevelop the Holborn viaduct area and was paid for by the developer. Note the potential for confusion between a rounded down £52m and £50m 2 years apart for different things. Also worth noting that the parameters for the London Bridge and Blackfriars rebuild (inc Bermondsey dive under) were set in 1990 shortly after the closure of Holborn Viaduct and the opening of the new Snow Hill Tunnels. As worked in London but lived in Brighton (Hove, actually) at the time, it’s only as a leisure service that I remember the Thameslink. As it didn’t run though during peaks, it wasn’t much use for work. Also, the King’s Cross Thameslink station was wonderfully close to the Victoria Line, which was often useful to get places to the north of London from Brighton. Thanks for another informative article on the Thameslink Project. Seems that the May TL timetable has generated as many LR articles on the subject as there are TL cancellations! As someone who worked on the South Central Division of the erstwhile Network SouthEast in the early 1990’s & worked on the Class 319 stock it brings back fond (?) memories. Keep up the great work & looking forward to the next instalment. A fortnight actually, aligning with school Easter holidays 1990. In earlier times the incongruous sight of freight trains coming and going through Farringdon, transferring between E.R. and S.R. I never saw this myself, but I recall there were pictures from time to time in the spotters’ magazines of the time. Is it because HS1 has fewer interactions with the rest of the network, and therefore less inter-dependency on timings? Or is it because, being faster, there is more leeway in terms of shunting times back and forth a little bit? Given that SE run services over the same tracks, I imagine the TT would still have had some effect there, which could easily knock on to the international services. @Briantist That picture you linked to has confused me thoroughly! I thought I understood the relative layouts but now I’m not so sure I do. In the middle of the picture – is that City Thameslink station being constructed? From where was this picture taken & which direction are we looking? One thing I do notice is that if your train terminates at the outermost bay at Blackfriars it can be a bit of a walk to reach the main through platform. If I were a Sutton loop commuter I’d be annoyed every time this happened (even if the intention was to terminate everything on the inner platform I’m sure there will still be occasions when that doesn’t happen). Perhaps some footbridges or something midway along the platform would have been useful? You are probably confused because the whole area (including small side roads) was totally changed. By my reckoning it is South looking North. Concentrate on the bus. This is almost certainly on Ludgate Hill outside the south entrance of the current day station. The railway under Ludgate Hill replaces the railway bridge over it. The existing tracks lead to Holborn Viaduct in the distance. What you can’t see is that the new platforms will extend for a considerable distance towards Holborn Viaduct. One of the less commonly cited benefits of the scheme was the demolition over the railway over the road which restored a traditional old view of St Pauls from Fleet Street not seen for over a hundred years. The interaction with Eurostar using the Boat train Route and modern day SouthEastern was considerable. If any timing changed on Eurostar it would affect a lot of junctions. The SouthEastern timetable was basically built around the Eurostar trains. Now there is still interaction but the purpose-built HS1 railway is built to a much higher standard with consistent timings, very few junctions and very few domestic trains are affected by any Eurostar changes. I believe there are loads of spare passenger slots available most of the time. @Pedantic of Purley apologies, you’re right about the first comment; but the second comment is in response to something actually mentioned in the article! (Fourth paragraph from the bottom). No big deal. It is just these things have to be nipped in the bud otherwise they get out of hand. And sometimes I am trying to track down an old comment and can’t find it because it isn’t where I expected it. Yes I did mention the bays being unavailable but that really was peripheral. I only said it would be better elsewhere. I wasn’t being sarcastic. The picture is taken from the old Holburn Viaduct Station looking south. You can see the Thames and Blackfriars Bridge in the distance. The old route via Snow Hill was not as straight as the current alignment as it had to curve around the preexisting route to Holburn Viaduct. I remember the “second phase” work where the track going north from Blackfriars station was lowered, and the line sent underground. That was quite a sensible bit of reconstruction really, the property redevelopment paid for the work, the new St Pauls/City Thameslink station replaced the rather isolated Holborn Viaduct station and the viaduct at Ludgate Circus, which blocked views up the hill of the Cathedral removed. From memory, the new City Thameslink station was for a while also used for terminating services from the south, as a direct replacement for Holborn Viaduct. They would go into the sidings then reverse back, I can’t remember how long this continued for before these were cut back to Blackfriars. You are obviously correct though it is not obvious that the bit in the top left is necessarily the Thames. It makes more sense though when you think about where the photo must have been taken from (assuming it was a publicly accessible place). Re: GLC money. My memory from, I guess info/publicity at the time, is that is was the cost of the feasibility study that the GLC coughed, since BR wasn’t willing/able to decide if the financials worked. Which, of course, gave them the ability to crow that it all happened because of them. @Pedantic, Blackfriars Bridge and the Thames are in the top right of the photo. Suddenly the perspective made sense when I noted this and the uphill slope of Ludgate Hill running right to left. My recollection, as a GLC member but not on the Transport Committee, is that the GLC’s key contribution in the early 1980s was to provide the necessary momentum to an idea that had been talked about a lot, but had previously never reached escape velocity. I studied the photo intensely the first time and could not see the river. Now I look again and it’s quite obvious! But I remain slightly confused as I had thought the platforms at City Thameslink extended most , or all of the way to Holborn Viaduct (the road). Is this not the case? Or perhaps the full length of the platforms are not yet built in that photo? I’ve not actually used the station, only passed through on trains and past the area on foot. The southern entrance to City Thameslink (on the south side of Ludgate Hill can be seen behind the bus and the Express group building between the railway line and Blackfriars Road on the South bank is also visible as is the curve building on the corner of Victoria embankment. We still need a comparison of how, on the first day that Thameslink opened, all the required drivers from Bedford and from Brighton were fully trained and up to speed on their extended route, something which, reading reports, the current imbroglio has not managed to do for even that initial number of drivers it was done for 30 years ago. One thing does strike me, that the running time from north to south, Cambridge or Bedford to Brighton, is around 2 to 2.5 hours. It seems the driver can make a round trip, and have their break, but then there is not sufficient time left in their shift to do a second such round trip. This is compared to just running in to London and back home again, around an hour each way, when they may be able to make three such round trips in a shift. You don’t want to have crew changes halfway along (although I believe they are doing so) as that causes all sorts of unreliability if the second driver has not made it in yet. But has there been some considerable loss of driver efficiency given the length of the routes, that they can make one but not two round trips in a shift. It was my intention to supply such information as to how route knowledge was arranged. It seems that such information is not recorded – or remembered by those involved at the time. It seems to have been taken for granted that you just did it. It was probably helped by the very low key start – even lower than I thought it was. The only other thing I can think of (and have only just thought of it when replying) is that there was a lot of inter-depot rivalry to be ‘master’ of as many routes (especially prestigious ones) as possible. I don’t think there would have been an issue in getting drivers to work on another region’s routes even if they supposedly all worked for Network SouthEast. I think many of them would have relished the chance and would have been very co-operative. Usually hauled, not by an N-2 but by an “Ardslely Tank” of class J-50 …. On the issue of efficiency, I think then drivers could cover all routes. if not on day one then probably eventually. On the north side they probably also drove some of the Moorgate trains so there would be more opportunity to tailor journeys to maximise their day. On the south side they were based at Selhurst so I guess there was potential for changing drivers either with an unannounced stop or at East Croydon so they could cover two and a half trips. At least if the replacement driver isn’t there, the original driver should be able to drive it back to the nearby depot. The opening of the Thameslink connection through central London may have been low key, but there was certainly public relations about the plan. My wife was construction correspondent of the Financial Times until going on maternity leave in summer 1987* and she was taken on a tour through the unopened tunnels before then — presumably by BR’s PR department — and probably (given her condition) in 1986 or very early 1987. @GT: Maybe, but by “magazines of the time” I was thinking of “my time”, and I have in mind BRCW Type 3s (Class 33 in modern parlance) emerging blinking in the sunlight on King’s Cross suburban lines. I recall that during its last year or so of existence, that the GLC funded a study into the benefits of reopening the Snow Hill link. Chris Austin, then in the BRB London & South East directorate, gave a presentation about the efforts to reopen the line under the multiple BRB and DoT and Treasury radars, at a ’50 years on’ event discussing ‘Beeching and London’ at the LT Museum on 2nd December 2013 . 1. Firstly, putting back the track, signalling and third rail electrification only cost £1m for the 750m of route involved. I also have (somewhere, can’t find it instantly!) in my railway planning library the report of an inter-regional BR working party on cross-London freight operations, dated around 1951. Reading it reminds one of pre-WW1 pre-Grouping connectivity, with multitudes of individual trip workings between the SE&C, LBSC, LSW, GW, GC, LNW, Midland, GN, GE and LTS yards dotted around inner London. Nothing appeared to have changed since the 1900s, except for the 1929 Lewisham Flyover which made freight trip workings between Hither Green (SE&C) and the Midland and GN (Brent, Ferme Park) much easier by avoiding London Bridge and the Metropolitan Junction spur. Unsurprisingly, the freight retrenchment and rationalisation since 1951 led to the closure of the Snow Hill route as a freight corridor, indeed it was remarkable that it lasted as long as 1969. Note that at least in Germany the main schedule change was historically in May/June as well. I recommend getting hold of, or sight of, Modern Railways dated April 1986. Points touched on in PoP’s article and the subsequent discussion here, notably JR’s above at 17.11, are mentioned. The emerging Network SouthEast is in there as well. There is an article by Alan A Jackson, entitled “BR in London: the GLC contribution”. He refers back to the Transport (London) Act 1969, by dint of which the GLC not only became the policy and financial controller of the Underground and bus services but was given the responsibility for strategic transport planning in Greater London, including power to make grants to BR to support passenger services. This act was repealed with the legislation to abolish the GLC so for the last few months of its existence, no further money could go on such grants. (Incidentally, Jackson refers to a companion article, in the February 1986 issue, about the GLC’s investment in bus and underground services.). The “Railtalk” column (unattributed, I assume the editor) weighs up the relative plusses and minuses of GLC and DoT (not in those days DfT) involvement and their contributions. Starting with the paragraph quoted above, this offers general comments on combined (but not necessarily co-ordinated) work on zonal fares, subsidies and so on. A combination of imaginative subsidy GLC and good housekeeping by the government was said to be beneficial, but of course about to be lost with the abolition of the GLC. 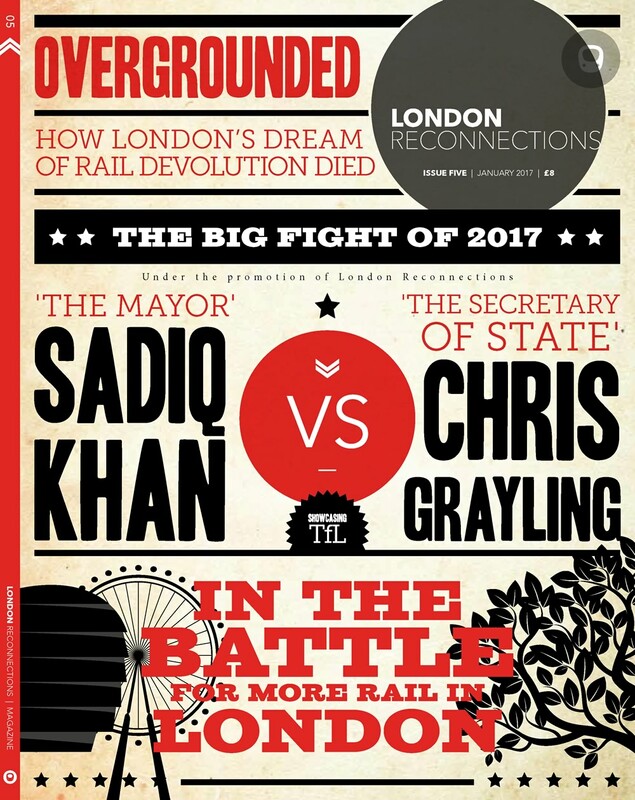 In this London-centric edition of MR, another item relating to this discussion, was a news item headed “Snow Hill: work starts” which says that the royal/parliamentary go ahead had been given to reinstate the Farringdon and Blackfriars lines. Contractors were on-site and through services were due to start May 1988. When the Thameslink services started on Monday 16th May 1988 there were a few services round, what is now called, the Wimbledon loop (2 in the morning peak and 5 in the evening). The trains terminated / started at West Sutton, although they were typically only there for under a minute. The booking clerk was amused to receive occasional calls asking him search a terminating train for lost property. In addition to everyone else’s comments about the photo, if you start at Ludgate Hill/Fleet Street and walk up Farringdon Street, all the side-roads on the right terminate at the old viaduct (Old Seacoal Lane, Old Fleet Lane, Bear Alley, Newcastle Street, Turnagain Lane). From distant memory, I think the northern entrance (on Holborn Viaduct Road, A40) to City Thameslink didn’t open for quite a while after the southern one (on Ludgate Hill). My guess is the photo was taken from the top of St Sepulchre Without’s flat-roofed spire, due south. Re Mr Beckton, driver efficiency. Whilst some drivers will do an out and back return journey, it is not the only way. Until very recently, there was a driver depot at Blackfriars, and many trains would change drivers there. Drivers could actually change almost anywhere. A diagram might be Bedford – Brighton – Blackfriars – Sutton Loop – St Albans – Bedford. Or Bedford – Blackfriars – Bedford x 3. With the new timetable, for dwell time reasons driver changes are banned in the core in normal circumstances. So the Blackfriars change overs do not happen, and drivers will now change at London Bridge, St Albans, Finsbury Park, Dartford, Croydon etc. Some trips have 3 changes of driver en route. Nevertheless, with flexible rostering, a shortish shift with nearly 5h driving time is relatively productive. There’s plenty of driving diagrams out there with much lower productivity. The £1.4m reinstatement cost was of course in the ‘good old’ BR days when accounting for projects was rather different. An awful lot of things that are now accounted for specifically to projects were counted as a corporate overhead (engineering trains, revenue loss during works, plant, even some design and labour). Separately, I vividly remember an episode of Tomorrow’s World from (probably) 1987 which had a feature about the (then) new and fancy Structure Gauging Train (SGT). This feature involved Judith Hann standing at the Farringdon end of the tunnel whilst a Class 73 went past with the SGT in tow, measuring the tunnel. The measured profile of the tunnel was compared to the previous (manual) records and the tunnel appeared to be about 6-10cm lower. Actually the track had been lifted by that same amount. This was several months before opening, yet the line appeared to be ready, and the younger me (Happy Thin Boy) couldn’t understand why it couldn’t open immediately. The May 88 Thameslink timetable was for 6 off peak trains per hour: half-hourly Bedford-Gatwick, with one extending to Brighton; half-hourly Luton-Purley, one via Crystal Palace and the other via Selhurst; and half-hourly Cricklewood to the Catford Loop, with one each to Orpington and to Sevenoaks via Swanley. There was no Catford Loop service in the peak, when some trains ran to Sutton instead. (Indeed, the first northbound train from Orpington on Mon-Fri was not until 1107 and the last was at 1557). In fact, the peak service was pretty sparse, with most MML trains going into Moorgate; prior to 0800, only five trains reached the Southern, and two of those had originated at Farringdon. Oh, and the timetable book that all this is taken from expired on 2 October. I first visited Kings Cross in 1959 and well remember a mixture of steam (L1) and diesel (NB Type 2 & Baby Deltics) hauling Quad-arts up from the Widened Lines. Don’t recall BRCW 33s on these trains, although they did in later years reach Dunstable on cement trains, but via another route. BRCW and Derby type 2s did get to Moorgate. Don’t forget too that a small number of trains did continue to reach Moorgate (M-F peaks) from the Midland route for some years after the GN services switched to the GN&C route. These were also loco hauled BR non-corridor stock, later became DMU, but the Rolls-Royce 4-cars never went to Moorgate as far as I’m aware. I thought this was because they had the longer chassis, but this can’t be so as the ex-WR units used later were the same length so may have been due to lack of corridor connections. I commuted from Bedford/Flitwick to Temple Bar area from 1981-1995, initially using the Piccadilly Aldwych shuttle, but switching to Farringdon once direct trains from Flitwick were available (I seem to recall that these were not provided off-peak and evenings at first) and then to St Pauls Thameslink as it was first known when that opened. Only the Ludgate Hill entrance was provided at first and the platforms (shorter than now) were open to the sky at the north end. You are correct in saying that the long subway connection to Kings Cross Thameslink was closed on the night of the fire, but I can’t remember the exact details. The fire started at the end of the evening peak so one would have expected that exit to have been available. When I approved the original TLK re-opening, the net cost, as stated by the Board, was nothing. The cost of the electrification was offset by a slightly smaller fleet requirement because of the elimination of two sets of stand time at termini. The Board remarked that any passenger benefits and revenue generation were additional but unquantified – “we could have these for free”, as they said. Nothing was said at the time about the value of linking Bedford to Brighton or whatever. Subsequent development of the services up to 1991 was organic growth rather than in pursuit of any master plan. It was Chris Green who spotted the possibilities opened up by CrossRail combined with TLK. His concept was for an express network that put most of the major settlements within the SE within one interchange of each other, Note the absence of any reference to local services within the conurbation. The 1991 Strategic Plan for NSE showed TLK as providing a core Bedord- Brighton service, absorbing the then existing services, plus, by the further absorption of other existing services, services to Ashford, Horsham and Guildford south of the river, and Lynn and Peterborough north of the river. The planned frequency was 18 tph through the central core using 319s. The scheme in that form was not intended to be a capacity enhancement, merely a linking of existing routes. The 1991 plan included no additional stock for the step up to 18 tph. There was no plan to switch to automatic train operation or install cab signalling. The problems of TLK today stem from moving away from that concept to a vhf mixed metro and regional operation which necessarily requires new stock and new signalling, coupled with the irrational attempt to introduce both new stock and new signalling (and new infrastructure) more or less simultaneously. Completely integrating the TLK operation with SE/SC operations rather than treating them as an overlay was a further mistake which has made recovery extremely difficult. OK, I’ve been looking at the 1945 aerial photos and Nick Catford’s write-ups and I’m still confused. There was a “high level” station at Holborn Viaduct, and a “low level” one. You can still see the alignment of the Low Level station at the junction of Snow Hill and Smithfield Street. When the Thameslink started between 1988 and May 1990 (when the new station opened called St Paul’s Thameslink) (for a year) did the trains stop near St Pauls? – there was a “temporary” station on the viaduct that got knocked down. When I first used Thameslink in about 1989 or 1990 there was no station in between Blackfriars and Farringdon. Holborn Viaduct was still open, and during peak hours some trains from the south terminated there. I think the closure of Holborn Viaduct coincided with the opening of St Pauls/City Thameslink, after a short line closure. The location that I always think of for under-city connectivity us Brussels, where border to border services pass through the central area stations. I believe this predates electric? The photo in question was taken from a window in Williams National House, a post-war building on Holborn Viaduct (south side), which I often visited on business. It was above and formed the frontage to Holborn Viaduct station in its later years. For Briantist, that is what you call the High Level station but never was since before the war, for the Low Level station on the line via Snow Hill tunnel to Farringdon had long since closed (except its platforms were retained for GPO parcels traffic on cross-London routes). As can be seen in the photo, the low level tracks are descending towards Snow Hill tunnel. The open site in front of the camera is the site of the former Holborn Viaduct (‘HL’). station, with its terminating platforms level with Holborn Viaduct outside. St. Paul’s (Thameslink) was renamed City Thameslink in order to avoid confusion for the Fire Brigade, who might otherwise have gone to St. Paul’s on the Central Line. As a point of reference, the bus in the middle background is on Ludgate Hill, whilst the track formation beyond that opens out onto the site of former Ludgate Hill station, the far end of which (out of view) is but a few yards from the Blackfriars through platforms. which is looking northwards from Ludgate Hill station towards Holborn Viaduct station, you will be able to appreciate the layout better, including the curvature of track so pronounced in the view dropping down towards the former Low Level station and Snow Hill tunnel. Until the work on the diversion of the low level route to the new station below, there were four tracks between the mouth of Holborn Viaduct Station and Blackfriars station. This response is somewhat long I’m afraid, but I have ‘form’ as they say. In late 1989 I was appointed as Thameslink Resources Assistant at NSE’s Network North sub sector. Network North did the planning and marketing for the Northampton, North London and Thameslink (Midland) routes. Operation of the services was still the responsibility of the Regions and timetabling and diagramming was undertaken at Crewe for the Midland lines and the respective Southern Divisions south of the river. I stayed with Thameslink for the next eight years or so though did have dalliances elsewhere in NSE for short periods, including a spell working on the Thameslink 2000 (as was) project team. Most of what was included in this article was correct, though some parts seem to have been lost in the mists of time, after all its the best part of 30 years and my memory is foggy too! From the start and for some time after there was the equivalent to the ‘Berlin Wall’ at Farringdon, crews did NOT cross the Regional boundary. This was soon recognised as a major performance risk (as indeed it still appears to be today!) Over time, probably in the region of 5-6 years it was all but eliminated and where ever possible through working was to be the norm. Part of achieving this was wrestling the planning of the timetables and diagrams away from the Regions. Sectorisation was already working towards this but at the time Thameslink was viewed in some parts as too small to sustain its own Train Planning establishment. I’m glad to say that common sense prevailed and one of my proudest times in the industry was setting this small team up in around 1993, (indeed one of my stalwarts from that very beginning only retired last year after the best part of 25 years working for the TOC). We at last could be the masters of our destiny, at least in terms of the timetable, unit and crew workings. It also enabled us to extended DOO operation for all services throughout the TOC. The original service patterns were – as indicated – little more than shoe horning the respective Regional rumps together, sometimes in not the most elegant of ways! This resulted in oddities such as differing calling patterns and origins/destinations in the peak compared to the off peak. Again this took some time to un-tangle and did have some false starts such as the commercially very unsuccessful experiment of routing services to Guildford via Epsom, Sutton and West Croydon, which even with some pretty unprecedented marketing at the time of the ‘new’ service offering never delivered worthwhile passenger numbers. Also around the time of the introduction of Eurostar services in 1993-4 we also looked at running an all day service down to Ashford via Maidstone East but came to the conclusion that it wasn’t commercially viable so didn’t take it forward. Jim Collins, the Managing Director of the stand alone Thameslink TOC that was carved out of Network North in about 1991-2 was clear that his vision, (shared by other senior management in NSE including Chris Green), was standardised service patterns that were consistent all day were the aspiration of the TOC and indeed ultimately Thamelink 2000. This was mostly achieved over time and included such developments as four trains an hour Bedford to Brighton and the provision of an all day service around the Wimbledon loop, or “Wall of Death” as it is also known. One of the original constraints was the limitation of only six trains per hour through Farringdon, north to south. There were issues with the close proximity of the LUL dc traction supply, the 25kv ac supply and the 750v dc supply, again my memory fails me on the detail but it was something to do with increased corrosion of nearby structures. So as a result the Regional M&EE (Mechanical and Electrical Engineer) had installed a electro-mechanical switching of the 750v dc supply which only was livened up when a train needed to use the dc supply from the Southern Region. When no train was in section the dc supply was not live. In order to maintain reliability the switch gear was initially limited to six trains per hour each way. Over time we pushed for an increase in the numbers slightly (8+) but I believe that the issue was never fully resolved until the ac supply was extended to City Thameslink. The success of the core Bedford to Brighton service simply highlighted the lack of peak hour services through London Bridge. Services routed via Elephant and Castle, Herne Hill and Tulse Hill were only not exceedingly slow but in many cases failed to dove-tail with standard paths on the Midland and Brighton main lines. I was tasked with finding more peak paths through London Bridge. And as ever being Thameslink we pushed as far as we could go. The result following a meeting with the MDs, Operations Managers and Train Planners from both Thameslink and South Eastern was an improvement on the very limited initial service but was still somewhat sub-optimal. This was a situation that has continued to exist with only slight changes until the timetable that should have operated from this May. At the time the expectation was that Thameslink 2000 would deliver the long term goals of the franchise and indeed it did, but many years later than expected. There have been reports that Thameslink has to be first on the graph and in my days that was almost correct. On the run up to the introduction of Eurostar services considerable planning was undertaken on how to the fit the International services into the congested south/east London. Eurostar took first place on the ‘graph’ with their aspirations in those heady days being 4 paths per hour to/from Waterloo, with two trains (a Paris and Brussels service) flighted 4 minutes apart every 30 minutes. As we know this level of service never was fully realised but in planning terms these paths sterilised part of the graph, in particular because we could run so few trains through London Bridge, Herne Hill became the centre of our universe! Thameslink services followed next on the graph and because the Eurostars did not cross at Herne Hill we were limited to six gaps per hour to thread our services through between them. So the Thameslink services were then projected both north and south from Herne Hill and this in turn determined where many South Eastern, Central and Midland Main line trains fitted around them. Exciting times and because the powers at be had a soft spot for the young ‘upstart’, Thameslink not me I hasten to add, we probably got away with more than other TOCs might have done, (the battleship livery on the 319s being one small example), but undoubtedly it was one of the most enjoyable and rewarding times of my career. It has been truely a shame to see the current shambles unfold. @ALFIE1014 – Truly an excellent account! Thank you so much for telling us. Living in Herne Hill (“the centre of your universe”) and recalling the Guildford services, which I used, I tried to encourage others but the routing was all stations to West Croydon and only from there it became a swift, semi-fast service to Guildford, so the ‘slow bit’ at the inner end may have discouraged some. However, I was surprised that the traffic from Croydon never picked up. I heard about the severe electrical problems at or near Farringdon at the time. They were described by one (in despair) “as if the whole of the Southern Region is being earthed at Farringdon”! Just where exactly was the regional boundary there? I used to receive the London Transport weekly Traffic Circulars for the Underground and right up to 1971 they all contained instructions regarding track circuits and for steam trains entering Snow Hill tunnel, despite the route having been disused since 1969. Was LT actually responsible for any part of the line? Thameslink of those days was indeed a brave project – and it just about worked, even if you could only get 2tph through London Bridge during peak hours (PoP mentions only 1tph but I recall the timetable adjustment to push 2tph through). Funnily enough, the peak Brighton/Gatwick services diverted via Tulse Hill also proved popular because they ran non-stop between E. Croydon and Tulse Hill/Herne Hill, thereby providing a useful, fairly swift link between what one might call inner South London and Croydon. https://www.google.com/maps/@51.5178836,-0.1030364,99a,35y,186.17h,74.2t/data=!3m1!1e3 is around as close as I can get the angle/perspective on google maps to show the same view today. It’s not quite right, but should help match it. Until the closure to passenger services, to allow a freer flow of freight during WWI, a suprisingly large number of services & companies used those tunnels. There are two book(let)s on the subject from “Connor & Butler” written by Geoff Goslin called: “Steam on the Widened lines” in two volumes. The GW ran freight through to Smithfield as did the GN & Mid passengers to Moorgate ( & their successors ). And the GN & Mid ran freight through to well S of the river, as the presence of theor freight-depots in the Railway Junction Digrams shows. But the LCD & SER & then SE&CR ran passnger services through to the North, too. I note, with astonishment, from your presentation, the then case for closing or downgrading inner railways “as population falls” – by which time (IIRC) it had already hit bottom! But that was the fashion, then, wasn’t it? The Brussel centre- tunnel was opened in 1952, so was electric @ 3kV DC from the start. Though, IIRC “planning” for this started in about 1902! Thanks everyone who has helped me understand that photo of City Thameslink. I think the missing bit was the fact the the platforms were originally shorter, with the northern entrance being added later – with this information the photo makes a lot more sense. Re the photo, the obvious point to me are the shadows so it had to be facing south. Who needs technology! For a while on a train heading north I recall passing old platforms and sidings which you could just make out in the dark. I assumed these were Holborn Viaduct platforms but not sure this makes sense from the photo. When they lowered the track into St Pauls/City Thameslink from Blackfriars it was quite a gradient. Back in heavy snow of 1991 that section was open to the elements (not sure if it still is) and the trains had great difficulty climbing the slope into Blackfriars. I waited and watched a train make several attempts! Great to hear the stories from people personally involved with the revival of this route. Keep it up. @Alfie1014 – thank you for that very full account. I used the Guildford service once to go to Waddon and it was extremely slow (well justifying the Southern tramway sneer of one’s north of the river colleagues) and over badly laid jointed track. Unsurprisingly I had the train to myself for much of the trip. Good to see LR digging into this again, and important context for Part 2… which I suspect won’t look pretty. @ Graham Hewett [6 June 2018 at 22:12] thank you for taking us back to the Thameslink plan that you signed off all those years ago, and identifying the roots of the current problem. Rising above the noise of the current mess, what would be your specification for a Thameslink Mk.3? Would you stick with the original plan of an “overlay” whereby a modest schedule of mid-distance services crossed the city? Or would you try and ring-fence it and maximise the (alleged) 24tph by imposing an intensive Thameslink metro service, segregated as far as possible, and fed by interchanges with mid-distance services? I seem to remember that a banking engine was kept at Farringdon for the goods trains – am I right? My Wife and I travelled from Bookham to Luton, probably in the ’80s, in order to get to Luton Airport. Very convenient! There is a relatively well known picture of Farringdon with the banking engine present. Maybe someone has a link? City Thameslink is more-or-less underneath where Holbon Viaduct is shown. Note the goods stations just N & E of Faringdon. In 1958 the layout was altered, a banking locomotive spur was removed from the Holborn Viaduct side, and a new one installed on the King’s Cross side, at the former goods yard on the west side of Farringdon. It was reported that this, together with changes to the signalling allowed more efficient working. These changes also meant that longer trains could use the route, increasing the maximum from 30 wagons to 50. Regarding the GLC proposals and involvement in the possibilities for the reinstating of this route, I wonder if they considered the freight possibilities? Their policy and grant remit was directed at local passenger journeys. However, it will be recalled that during the period up to abolition, they were very keen to reduce the amount of heavy goods vehicles passing through their territory. Fascinating, well done. Prompted to look up the printed version, I found that there is a line missing at the end of the version on the link, “(Continued on page 580)”. Page 580 has two further short paragraphs. One is about services 1916-1929 when Ludgate Hill Station was closed. The article concludes by noting the renaming of the former Metropolitan Railway stations, Aldersgate etc. So, perhaps these are not essential but I thought it worth pointing out. Having worked closely with the GLC’s Dave Wetzel (and attending the formal ground breaking ceremony for the new link shortly before the GLC’s abolition) I would agree with Bryn Davies that the role of the GLC in getting the scheme off the ground should not be underrated and was far from limited to the cash contribution made during construction. The GLC had started pushing for the re-opening of the Snow Hill link, as it was then known, almost from the election of the 1981 administration (building on some work undertaken by the previous Labour administration – 1973-77 – under Sir Reg Goodwin). The main opposition at the time was not (or, not just) the Treasury or the DoT. Initially they were just not really interested. The main opposition was from British Rail’s London and South East sector. They were bitterly opposed on the basis that the scheme would merely import delays from the MML into the Southern region, and vice versa. This led to the GLC’s funding for a feasibility study which, coupled with a change of personnel at L&SE sector, resulted in BR becoming supportive. The rest, as they say, is history as has been set out above in terms of the arguments deployed to persuade the Treasury. But without the GLC as a cheerleader, it’s certain that Thameslink wouldn’t have opened in 1988 and, maybe, might not have opened at all. Farringdon – Part 2 . I cover the Smithfield Curve and link to the Railway Magazine article in: Part 1. The rich complexity of the railway system in this small area inspired me to write the articles, and to weave the various sources together to tell the whole story. The conclusions regarding safeguarding remain pertinent, perhaps even more so given the fragmented governance on the railways now. For example, if they had provided for four tracks when they rebuilt the route through St Pauls then the Elephant & Castle route could have extended to Farringon (and perhaps beyond) using the extensive sidings there for platforms, so providing far greater connectivity with Crossrail. quinlet: Interesting. Note that the opposition you mention from BR (about importing delays) may have, rather late, shown up as prescient. Though it could be shown to be wrong if/when the current difficulties are overcome. It seems the memory isn’t what it was, I’ve been reliably reminded by a colleague who was a driver at the time that through working of crews did commence at the begining, (except on Sundays, presumably due to engineering works). Bedford, St Pancras, Selhurst, Brighton and Orpington crews all undertook extensive training in advance of the opening, including using a SR class 73 and saloon, the only time he got to drive an ED! My bad – sorry for the confusion, late night posting sometimes is not the most reliable means of communication! @Quinlet and others – the Treasury wasn’t involved. In fact, not even Ministers had to be involved. Because the scheme was so small in terms of capex, it came well within my delegation. Of course, one consulted Ministers and they were very supportive – especially as it cost nothing. As far as I know, the Treasury remained blissfully unaware of what was going on (unless the Treasury knew to dig out whatever the GLC had told them a few years previously). POP An example of former through working in London was the short line through line from Waterloo to Waterloo East, which I am sure you know of. Had it been allowed to develop – rather than be closed at an early age – it would now have been a boon to London’s rail system. Ian J, Peter Staveley: The former Kings’ Cross Metropolitan was also known as plain King’s Cross Midland (this was even though the station still sported tube roundels in BR days.) We could see the station (and the Metropolitan too as it ran beneath Leeke, Britannia, Wicklow, Swinton Streets) from the roof of my aunt’s flat. BTW the very last traces of the old Metropolitan Railway entrance to the old station were razed to the ground a couple of months back in readiness for the new development bordering Pentonville/King’s Cross Bridge/Grays’ Inn Road. @Rog _ I very much doubt that running frequent passenger trains across the concourse of Waterloo is a good idea. @ROG: Given the tendency for SWR to have a complete meltdown, when something goes wrong, that’s not a good idea at all…. And as Graham H says, crossing the concourse is also not so good…. Add in the fact that you’d be coupling the SWR service with the SouthEastern service (not exactly known for its reliability either) and you have a good recipe for shutting down most of the South East. @ANON E. MOUSE: When I compare my normal commuting experience with that of my colleagues on SWR, mine is an absolute dream! We should also mention the difference in the clock face timetable. SWR uses 15 minutes, SET uses 21 (in the peak). But of course we know Britain’s railways, deep in its knees with its woes, limited track layouts, stupidly long single track sections of main line where once there were two or more etc, and gigantic timetable failures, perhaps its a good job it wasn’t developed. Re ROG . A direct service from Staines, Richmond, Waterloo, London Bridge & on to Greenwich etc would be a wonderful boon. It requires only an eight foot high bridge from the international terminal tracks over the concourse & onto the existing bridge to Waterloo east. If “Southern Heights” etc had had their way there would be no Thameslink, no Crossrail, no sharing of SWT & Southern routes around Epsom. I accept that Network Rail also has a big share of the blame too. Probably also because it fails to control part of its work force. @Rog and others – I forbore from pointing out that the tracks at Waterloo East and Waterloo (including the former Eurostar tracks) are all the same level. Therefore linking them across the concourse involves, effectively, a giant level crossing complete with third rail. I don’t know whether you have visited Waterloo, but one of the key features of the concourse are many hundreds of people moving around from one end to another seeking their trains. Putting a barrier across that lot every few minutes would reduce the passenger flow to complete and utter chaos (not to mention the train service as the staff tried to clear the level crossing. Of course, you could try and climb up from the tracks over the concourse and down again; personally I’m a great fan of Abt but i fear that only Loescher would cut the mustard. The link was only ever used by a handful of specials. @Lemmo – It is very difficult, operationally, technically and commercially to make a route serve both mid-distance and local services, although it does happen (eg the Brussels cross-city line, but even that seems to separate the two types of operation). I would have stuck with the original concept and if – stress “if” – a metro service was required along the same corridor, I would have built another pair of lines. As it is, TLK is neither fish nor fowl and many of the problems now faced stem from an attempt to combine the two roles (eg in the matter s of stock and signalling). [To mention CR2 would be simply indecent]. @Jim Elson – NR’s problems seem to stem not from a failure to control its staff (if anything, NR overcontrols its staff), but from a failure to undertake adequate preparations before embarking on its civils. For example, the surveys of soil conditions before starting piling for OHLE masts seems to have been perfunctory to say the least. I also understand that neither the Northern nor the TLK operators were willing or able to supply details of rolling stock to enable the timetables to be constructed early enough, nor willing to apply the rules of the plan properly once the stock’s performance was known. A direct service from Staines, Richmond, Waterloo, London Bridge & on to Greenwich etc would be a wonderful boon. 2. People want to go North of the river, how many extra tube lines are you going to be able to fit under Waterloo and where else would they go? 3. A boon to whom? Presumably if the Waterloo-Waterloo East link had not been closed, someone would have thought of lowering the concourse at Waterloo. Nobody is suggesting that there would still be a pedestrian level crossing in the middle of the station. @GRAHAM H: But that is not what I am saying. People may have misunderstood me. If it had been at all retained and developed I am sure the concourse would have been built differently to accommodate the tracks. Everyone keeps slating me becos they think I advocate the dodgy arrangement that existed where the tracks crossed the concourse on the level. I did not even suggest that. The fact remains that the SW and the Waterloo East lines are at the same level, so you would have to rebuild Waterloo completely with an upper concourse and – presumably – either escalators or stairs down to the platforms as well as find some method of getting people up from street level that could be fitted in between the street and the concourse., Neither cheap nor user friendly – all for a very small gain, viz constructing a through line from nowhere special to somewhere else not very important via somewhere that misses the main traffic objectives. Not only that, but it would add a flat junction just beyond the throat of Charing Cross which would lead to a loss of capacity at a critical point, Altogether unappealing. @ChrisMitch – no they wouldn’t because the tube (Drain especially ) is quite close to the surface there. 1. The tracks could in principle be linked, by altering the level of the concourse. 2. The existence, more than a century ago, of a level-crossing link is not really relevant. 3. There is no law of nature which say that one end of a crossrail must be north of the Thames. 4. This article is about Thameslink. 5. Occasional mentions of other hypothetical crossrails are in order, where they develop out of the discussion, as here. 6. But (see point 4) we do not wish to get distracted too far into detailed discussion of the merits or snags of such hypothetical crossrails. Doesn’t the Brussels link have fast and slow lines? The similar-to-Waterloo through-the-terminus link at Liverpool Street fared even worse – I don’t believe any trains ever went to/from the main terminus from/to the Metropolitan Railway before it was lifted well before WW1. Additionally it was a direct route to the East London Line until St Mary’s curve was built. @Malcolm – this is all partly my fault for suggesting that if TLK had been left as originally intended, it would have been mainly a regional express network and any metro function would have at least been separate and quite possibly on a different alignment altogether. One particular feature of TLK as is, is a relative paucity of convenient central area connexions (KX/StP, I’m looking at you, LBR hmm), with City TLK being in effect a standalone station, albeit very convenient for the western City. In fact, I would have been more radical and closed several inner stations to TLK traffic altogether, but then I would have looked harder to develop better regional services, too, than the 1991 Plan. The dire nature of the Guildfords has already been noted. The Brussels case, as noted by contributors above, works because (a) the services are physically separated by function, with the regional/IC services only serving Midi and Nord, and (b) the CBA of Brussels is relatively small compared with London. I think the point is often overlooked that the essential point of a CrossRail scheme of any sort is that it does provide some form of regional crosslinking beyond the continuously built up part of the conurbation. After all, merely linking suburbs across the centre is something that pretty well every metro system does anyway. In the case of London, the very unfortunate split between LU and NR inners masks this functional distinction, but it is there, with many Southern lines offering distinct fast outers and slow inners. TLK as is gets this all muddled up to the detriment of both types of journey. Some have mentioned some of the odder London “reconnections” such as the Liverpool St link. The Middle and Outer Circles and the GW services to Victoria and over the north Circle, or even the NLR system might also have been mentioned (but weren’t, possibly to save moderators’ blood pressure.) But none of these was in any sense a CrossRail or regional linkage; most were very infrequent or used by special/dated services only and most were done for by either the electric tram or by the B Type. There are also the minor stops at Chapelle and Congres, which I believe are served only by suburban trains during peak hours. The connection was only ever single track, although the bridge was wide enough to accommodate a platform as well. However, the rebuilding of the LSWR station was well under way, and the connection already removed, by the time the SECR station came under the same management in 1923. Who knows what might have happened if rebuilding had happened later? But I see Lemmo’s question there is still unanswered. The allocation of the Class 700 trains suggests a metro future, not some British Rail/Network SouthEast inspired Regional Express network. BR always did have a pedeliction for expresses over locals. The Guildford Thameslink services provided an excellent Guildford to Croydon fast service, but it was hard for people to get past the long destination list, especially Luton/St. Albans. @MikeJones – I suspect ypu may have missed the point. The question as set, is: what is the function of TLK? If you judged from the rolling stock, you’d think it a metro. If you looked at the basic infrastructure – disposition of stations, for example, you’d conclude the opposite. And if you looked at the pattern of services, you’d think it to be a regional network. A compromise therefore – and one which won’t change in the future without a radical restructuring. If it were to become a metro, we would see many more Wimbledon roundabouts. The design and fitting out of the stock was driven entirely by the need to deal with dwell times at the three core stations, rather than any metro policy – that much became very clear to the bidders for the rolling stock contracts at the outset. Three stations do not, however, a metro make. Some may have found the Guildford-LBR service useful, but it certainly didn’t have the characteristics if being “excellent” unless you liked 20 mph travel over jointed track, and unless you were prepared to wait for the odd half hour or so. At all times it was much quicker from Guildford to get a fast to Waterloo and the tube onwards. A few direct Southern trains still run that route in peak hours, and the service seems to be rather less awful, with welded track and speeds of 65mph+ in places, when I had to use it recently. The 18:22 Guildford – London via West Croydon was about 15-20% seat occupancy at the start of its journey on the days I travelled, so it has picked up a bit. Would mods permit an extra off-topic comment on the LSWR/SER link at Waterloo? WJ Gordon’s “Our Home Railways” of 1910 implies that the only time it was used for a scheduled service was for 18 months during 1865 – 1866, when he said the LSWR ran a Euston – Kensington – Waterloo – London Bridge service as a nuisance campaign to persuade the SER to collaborate in building what is now Waterloo East, and the service ceased when the SER agreed to the station project. He also said that apart from that it was only used for rare troop train movements, which agrees with its brief mention in Wells’ “War of the Worlds”, so perhaps there was a government requirement to keep it usable pre-WWI. I have a recollection of reading – some time in the last 50 years – that it was normally covered by a “movable platform”, but have no idea of the source for that. Yes, there was a moveable bridge/platform. Somewhere in the LR archives there is a photo of it, forwarded by my self, many many moons ago. Apologies for missing your post earlier, I probably left the page open without refreshing it. Completely agree, even with improvements I saw, the Guildford-LBG service only made sense because I was travelling on the part of its route where it was a bit quicker and easier than the alternatives. For any one heading to a Southern station further north than West Croydon, it would be quicker to pick up a fast train and double back, so it was effectively two services overlaid: LBG to Sutton or maybe Epsom, and West Croydon to Guildford. When I got off at Waddon each day, I doubt there was a single person left on the train who had boarded at Guildford: for most of them it was probably equivalent to a SWR service via Epsom, with just a few like myself benefiting from not having to change at Epsom and Sutton as with most services. Just like Thameslink, almost all the journeys would have been subsets of the route, with people like myself being a tiny group of users. Nevertheless, I was very grateful for its survival, because at that time of day both the Guildford – Clapham Jc and Clapham Jc – Croydon services would be standing room only, and the normal “change twice” service was fraught with opportunities for small delays to mean missed connections and an extra half hour wait en route. Before the Thameslink service, a trip via Sutton from Guildford to Croydon would have involved changes at both Effingham Junction and Epsom (calling at all stations). It just wasn’t clear, in that direction, what was being offered. If I recall correctly, it was well timetabled and quite speedy to Croydon. The track condition was not an issue. the time neither had much of a suburban traffic. Can I add another anecdote to the list of uselessness of Thameslink services, in this case a current one ?? I think it was after the Guildford services had ended, I made fairly frequent trips from West Ewell to Mill Hill Broadway. Ah-ha, thought I, a wonderful opportunity to use this Thameslink thing, just one change needed at Wimbley-Don. Oh, no. Far quicker was Waterloo, Jubbly to West Hampstead and change there. Still the case. I’d agree that thameslink suffers from being neither one thing or another, but to my mind a lot of the issues – driver knowledge of the entire route, trains and drivers being out of position – stem more from the long-distance side of things. Being able to get from one town to another with a single change is nice, but given a limited number of cross-London tunnels (particularly with stations already built), a metro service seems to me to be the more valuable/efficient use for them. If I were creating a service pattern for thameslink with a blank canvas I’d look to cut back the endpoints to closer commuter towns (e.g. Hatfield/Welwyn), ending up with something more comparable to Crossrail/RER/Marmaray/… Of course it would be politically impossible to curtail services that already exist, but extending new services to the likes of Peterborough strikes me as unwise. @Graham H – regarding the through working, on rereading the passage I see that the South Western added Cannon Street to the destinations after the first six months, presumably involving a reversal to continue to London Bridge, which must have made it even more of a nuisance to the South Eastern. Gordon refers to the service as “little patronised” , and says “The South Western complained that the South Eastern Company were deliberately discouraging the service, as they were, and at last gave that company notice to complete their engagements and build Waterloo Junction. This, much against their will, they were compelled to do, for they had hoped to save the expense; but as some relief they asked that the through service should be taken off, and this was done on New Year’s Day 1867”. From the statement that the service had few passengers, and from it seeming to be designed to obstruct as many South Eastern train paths as possible, I assumed it was more of a negotiating tactic than a reflection of actual passenger demand. Gordon also says that the South Western had earlier bought up properties east of Waterloo with the intention of continuing to within striking distance of the City before a financial crisis forced them to abandon that plan. Presumably the pressure on the South Eastern to build the interchange platforms was to keep the SW service attractive to City commuters, even though it terminated short of their objective – the same motivation that later led to the building of the Waterloo & City line. @Graham H confirms what I said about the bias of BR to longer distance services, which has a direct bearing on the Thameslink we have today. The belief that longer distance services were those that brought in the money, is both incorrect and misguided, if understandable. The Travelcard arrangements meant that any improvement to inner-suburban services, would not wash financially as revenue would be spit between BR and London Transport. Also, while in marginal costs longer trips were revenue earners, in total costs they are not. On Great Northern, the Hitchin flyover, Stevenage Platform 5, slow line speed improvements, and power supply augmentation on the Cambridge branch are all consequences of this policy. While outer-suburban services expanded, the inner-suburban languished with a 20 minute service reduced to 30 minutes off peak and weekends. The other issue with BR planning was, that despite large tax-payer subsidy, it saw itself simply as a train provider, not a instrument of economic change. Today, with TfL we see the benefit of a wider perspective, and a greater emphasis on intra-London services (aka London Overground). This is why Thameslink needs to be re-imagined as a metro service, and they at least has the right trains for the job. @MikeJones – not misguided or incorrect at all. The evidence was clear to anyone who looked at the costs and revenues and understood what they were looking at. Put very simply, longer distance travel consumed less assets (especially complex assets) per pkm, and fewer staff/km. There is a reason why IC turned in a cash surplus and why the longer distance commuter TOCs – sc SW – have been able to cover their fully allocated costs. Had we had the luxury of starting the railway system with a clean sheet, we – mainline rail operators – would have been very happy to ditch the short distance market altogether and whistle through the London suburbs non-stop, leaving the market to the metros and trams. This is, of course, precisely what many private operators did when they closed whole rafts of inner stations even as early as ww1. I think you have rather missed the point Mike Jones was making because, understandably given your background, you are looking at it from the perspective of a railway economist looking at narrow criteria. The critical phrase in his comment was not a instrument of economic change. The benefits of suburban railways are not to the railway company. It is to the economic well-being of a city. Hence the success of the much subsidised London Overground. Arguments about the more efficient use of stock etc. count for little in this content. The much-maligned Dr Beeching recognised it in his report. Paraphrasing what he wrote, he said that any sane railway operator would go for the longer distance traffic and if society placed a high value on suburban railways then society would have to find a way to make it worthwhile for the railway to run them given that it is highly unlikely that the money can come from ticket sales. Surprised that the European examples do not mention Barcelona. Could you explain “Barcelona” to us, in this context, please? @PoP – absolutely. And that is why I made myself unpopular with a certain coterie of DfT officials by pointing out that Dr Beeching had been asked the wrong question. The issue was not how can we make the railways profitable, but why are we subsidising them and what do we therefore wish to buy. The problem was, however, “insoluble” in the sense that if the answer to the second question was “passenger miles” then logically you would subsidise IC [Inter-city]; if the answer was some form of economic user benefits, then you gave the money to IC and NSE [Network Southeast], and if the answer was wider community economic benefits, you gave the money mainly to NSE. However, it was RR [Regional Railways] that consumed the much of the cash and it was very difficult to find any argument that would justify such expenditure. Nevertheless, the dearest wish (in those days) of Ministers was to avoid another Beeching at any price. So we fudged the PSO [Public service obligation] and stated baldy that we were buying so many train miles a year – why we were doing so was left unstated, but the real reason was, as one colleague put it “We spend the money because we can’t help it”. Or more cynically, as the Perm Sec put it when appointing me – “We give the Board £ 1 bn a year, and they take, in return, all the flak”. It would have been intellectually desirable to move to the sorts of justification that you in LT were used to but no one could be persuaded to grasp that nettle. Matters were not helped by the fact that LU had embarked just then on a major upgrade of its tube stations and Ministers shrank from the idea of bankrolling such a programme for BR, which they feared would be the outcome of applying socio-economic tests. However, within the envelope of buying 119m train miles/per annum, BR was left free to choose which 119 they ran. From, as you say, a narrow perspective of cost/revenue BR preferred to cater for longer distance trips, for the reason stated. Contrarywise, LT really had no choice but to develop a methodology to justify subsidising short distance travel. Although LT had washed its face, according to the accounting conditions of the day, into the ’50s, it had become obvious by the time of the GLC takeover that that couldn’t continue. At that time, there was no PSO for the mainline railway and only a system of fragmented grants based on individual services – hardly a model for LT. Full marks to 55 Broadway for seizing the opportunity to put the whole boiling on a sounder intellectual basis. @PoP – I ought to have added that in a partially subsidised railway business where you have to allocate costs and revenues for the purposes of distributing subsidy, the issue of which services have a better cost/revenue ratio remains paramount. So we were always interested in the long/short issue. Moreover, that issue would remain even if we were pumping money into short distance services on cost benefit grounds. So not at all a “narrow” view but one that is fundamental to bankrolling the industry. What is ‘the Harpenden effect’? And given the current pattern along the to-be-Elizabeth line beyond zone-6 is 2tph most stops (including those inside London) to Reading and 2tph most stops to Didcot, surely the going too far out (which from context of the thread seems to be what you are alluding too) will be reduced? One key driver for Thameslink to serve regional destinations, rather than metro ones, is train lengths and the desire to maximise the usage 12-car trains in order to maximise capacity through the core. Graham H: Isn’t the devil in the detail of how to allocate costs between different users for the fixed assets when these assets are shared between services? Different ways of allocating these costs would surely show different services are profitable. (And wasn’t BR known to put lots of loss-making activities into Regional Rail). Moving from “routes” to “sectors” certainly helped to make cost allocation significantly more opaque. @Aneconspeaks – Yes indeed , cost allocation is , of course, the key. How you allocate costs depends on why you are doing it. For example, when closing a line you want to look at avoidable costs – a different answer, naturally, to the marginal cost allocation you might want to make when changing some input; and then again, there’s fully allocated costs. Overlay that with fixed, variable, and semi-variable cost, locatable and semilocatable costs and you can have a multitude of answers. – not as the cynics would suggest, depending on what answer you wanted, but simply on why you wanted to know. However, the costing system had been pretty thoroughly thrashed out by the time we came to sectorisation and the principles didn’t change – only the “recipients” of those costs. You are right that the boundary between IC and RR wavered somewhat (NSE was fairly self contained). It was DTp rather than BR which drove those decisions, however. Bluntly, IC was the vessel for anything that was profitable – hence the inclusion of Gatwick. People hesitated over TPE for a long time and the decision not to include it in IC had rather more to do with branding and quality issues than profitability, which was marginal. If I had had my way, I would have also pushed the RR Alpha Line services eventually towards IC with which they had many characteristics – fares elasticity, distances travelled, scope for adding to the offering, and so on. [ In fact, the “Hewett plan” for eliminating central government subsidy would have seen the Alphaline services moved to IC, the PTEs, Scots and Welsh taking on full responsibility for their operations, leaving – alas – a rather odd ragbag of RR services (mainly in the West country, Lincolnshire, Lancashire and Cumbria). Some of these could have been handed to the county councils but as the subsequent history of subsidising PTEs showed, it was tricky/impossible to find a suitable formula for transferring grants to the right recipients]. One of the major termini in Barcelona, Estacio del Nord was totally eliminated by redirecting the line under the city, also reducing the importance of the Estacio del France terminus, converting Santes from a terminus to a through station, and establishing Place Catalunya as a main line station. The new high speed line is replicating this. An earlier example could be the line through Tara street in Dublin. Barcelona is a good comparison to Thameslink because they have two through lines through the city centre (one via Passeig de Gracia and the other via Placa de Catalunya, converging at Sants), both of which I believe are only two tracks and used by trains from local to inter-city. It was my impression when I visited, although that was some years ago, that services are chronically delayed as a result. Well to be really pedantic, it is not true to say that “One of the major termini in Barcelona, Estacio del Nord was totally eliminated“. I can assure you that it is still a major long distance terminus having been there in the past year or so. OK, so it is no longer a railway station and is now a bus station. My knowledge of Barcelona is not good but don’t think it is really comparable because there is now no proper railway station (as opposed to metro) anywhere in the vicinity so I presume it must have been diverted further out. So, in my eyes, it is more akin to Broad Street. IIRC Berlin doesn’t count, becuse although Anhalter, Postdamer & Nord-Bahnhöfer have all ceased to exist & we now have (Zentral) Huptbahnof, the metro lines, operated as S-bahnen are separate, parallel tracks, with no inter-running & dilution/mixing of the services. The long distance vs short distance argument was raised at the time of planning for Crossrail, with the Superlink alternative proposal for a network of regional services reaching Northampton, Cambridge, Ipswich etc – more like Chris Green’s Network SouthEast vision. The argument was made that revenues from long distance services would be higher – and the counter-argument was that Crossrail’s metro-style scheme had higher social and economic benefits. Plus of course the performance problems created by having a large number of long branches. Time will tell which out of Thameslink or Crossrail works out better in practice. But I know which one I would bet on. Which makes an interesting question for “CR2” doesn’t it? Though, IIRC, the proposals are more “Metro” style than long distance. ‘Latest’ (ie 2015 consultation) version of CR2 had Broxbourne as its northernmost station. Hertford East disappeared earlier. However your point is correct in that CR2 would be a suburban service but four tracking of the West Anglia Main Line would allow the separation of metro, CR2 from long distance services to/from Cambridge and “London” Stansted. @Briantist and IanJ – I deliberately forbore from mentioning CR2 in this context – with only one intermediate station within the Circle, and tentacles that reach quite deeply into SWland and Herts, it is hardly a metro Hence the separate metro version of CR2). I suppose the issue for debate is whether there is actually a justification for a regional express network – commercially probably not, in planning terms probably yes; the TLK Mk1 version would have worked because it required little or no expenditure to put it in place; as we all said comfortably at the time of approving the original scheme : you can have all the benefits for nothing. I didn’t realise that Hertford E [HFE] had been “cut off” so to speak, though it owuld make sense for CR2 as, separate convenient branch to terminate in, rather than the 4-platform station @ Broxbourne. Des “HFE” thus get reduced to a shuttle, or do its services then run fast to Liverpool St under the most recent proposals? 1. Could the decision to leave Hertford E out of CR2 have anything to do with the fact that Ware station is single track? 2. The Borough of Broxbourne was very nearly included in Greater London. Compared with Maidenhead (let alone Reading) the proposed CR2 termini only just poke their noses across the GLA border, and indeed only two of the termini are outside the existing Oyster PAYG area. Coming very soon, Stratford to Meridian Water. The first three in the list all cross the GLA boundary to terminate in Surrey. Their fare zone status does not necessarily indicate this. I had overlooked the handful of Chiltern services that terminate at West Ruislip, but they are essentially short workings of the Wycombe line – it would make little sense to separate them from the rest of the Chiltern services. One could indeed make a similar argument for South Eastern’s “roundabouts”, which are essentially Dartford services stopping one station short, with the loose ends tied together. From what I recall, although the though route to the Metropolitan line at Liverpool St had a short life, access was not provided for the public to cross behind the terminal buffers until the station was reconstructed, a footbridge providing the only connection. With Thameslink, it’s hard to find metro services to takeover north of the river, especially with the GN&C needing services too. And it’s not as if Luton and Stevenage (and Tring and Aylesbury) are that close in anyway, despite being served by all-stations services (OK, Luton skips Kentish Town). And then south of the river you have TfL wanting to take over the inner operations and limited choices for providing all the service with Thameslink anyway so you might as well use the BML fasts out of London Bridge and serve outer suburban operations like East Grinstead, Gatwick, etc to match similar distance services the other side. Another cross-london service, although not ‘through’ the center was the Anglia ‘London Crosslink’ which ran from Basingstoke via the North London Line over to East Anglia with various destinations including Chelmsford, Colchester and Ipswich using 170’s back in 2000 to 2002. It wasn’t very frequent or regular and the Anglia end destination varied which I’m sure didn’t help it being a useful service. link Intercity 125 services from 1994 to 1997! Not to mention the odd Cardiff to Waterloo services which ran via Olympia, and the Night Riviera which also ran to and from Waterloo for a few years. All of these were supposed to be temporary measures to provide connections with Eurostar, until the direct Eurostar services beyond London could be introduced. After the sleeper’s return to Paddington in 1998, the Wales services were the only regular passenger services over the “Sheepcote Lane” spur in Battersea, finally running as a “parliamentary” service early on Tuesday mornings, and later substituted by a minibus before formal closure in 2004. I understand part of the problem with closing it was because the service was latterly run by the old Wales & Wessex franchise, and as that was to be split between Greater Western and ATW no-one could decide which of the new franchises should be responsible for managing the closure. Caught it once. Very slow. Redundant once that speedy Jubilee line opened between Stratford and Waterloo. At about the same time as the east-west services mentioned by John, was there not a period when trains from Harwich to the north went via Stratford? I recall being surprised to see Shenfield and Chelmsford appear on the indicator boards at Milton Keynes. I think this service was to make use of the newly electrified routes around Stratford to reach the North London line and so on. Almost certain it was cross country to Manchester Piccadilly and went nowhere near London. Except for emergency diversions, the Liverpool, & later Manchester – Harwich boat trains never came south of Ely. PoP. Not Manchester. These were ‘inter city’ type services from Scotland to east anglia that ran via Stratford. As I recall, very limited frequency and hopeless publicity. I think (does anyone have better memory) that they ran through Stratford but didn’t serve Stratford. Long time ago, early 80s I think. GTR’s Charles Horton has today bitten the dust. PoP: In days gone by, trains connecting with the ferries ran from Harwich to the north west via Ipswich, except perhaps for this period that I am alluding to. How else would they have reached MK if not via London? Perhaps Harwich was not their eastern destination. I am sure that for a relatively short time, there was a direct service between MK and Essex. Before WWII the service started from Liverpool Central, went over the Woodhead, Retford, then, I think went “up” the GN main line, turned E at Petrborough, Ely, Ipswich, Harwich. In later days, it started from Manchester Central, then even later started at London Road ( “Piccadilly” ) & followed the same route. I think it breifly went via the Hope Valley, after Woodhead closed. Somewhere I have a photo of a “EE-3” ( Class 37 I think ) hauling said train through Guide Bridge in 1965 or 66 ….. Yes, that’s enough detail about the Harwich boat trains. Twopenny tube evidently saw trains through Milton Keynes with Essex destinations, and assumed that they were a version of the Harwich boat trains: a reasonable assumption, given the multiple routes which said trains have taken. However, it appears that in fact they were something completely different, as mentioned by Island Dweller. There was indeed a short-lived “European” service from Manchester to Harwich via the North London Line. But the traditional “North Country Continental” route until 1973 was over the GN/GE Joint Line through Lincoln, not the ECML. Thanks for that, timbeau. The mancunian article you link suggests that the service via Watford Junction also served Ipswich. This is either a mistake or the train must have reversed at Ipswich, which strikes me as somewhat improbable. But that is a small detail – either way it seems to clear up the original question. 1140 ex Edinburgh/1145 ex Glasgow Central via WCML and Birmingham, calling indeed at Milton Keynes, Watford Junction (1815) Shenfield (1933) Chelmsford and Colchester. Definitely not Ipswich, and not a named train. Return working at 0750 from Harwich Parkeston Quay. A quick check of an alternative via Euston and Liverpool St would have left Watford Jn at 1810 for a 1926 arrival at Shenfield – so in this case, travel times were almost equal. After the freight lines on the North London were electrified at 25Kv ‘The European’ was electrically hauled throughout. I have a photo somewhere of it passing through Caledonian Road & Barnsbury with class 86 haulage. I don’t think the service lasted long after that. The successor to the ‘North Country Continental’ is now pared down to a Cambridge – Parkeston Quay DMU. With eight intermediate stops! I used to visit a second hand bookshop on the Holloway Road, and as I lived in Staines at the time the Cross London link in 2000 is was great as the trains seemed so luxurious compared to the stock at the time. But it was agonisingly slow. On the trip I kept wondering why we were inching around London in first gear though we only opened the doors at a couple of stations, we might as well have been an all shacks service. The number of full platforms I was in with passengers forlornly looking at an near empty train with the few of us nearly comatose with frustration over how bloody slow it was. It annoyed me greatly, that it was much quicker to get two tubes to Waterloo. I could not understand how it was possible. @RationalPlan – I suppose this was the sort of thing that competition and open access was supposed to encourage, but without access to any useful market data…. Maybe, just maybe, the service promoters had heard how CrossCountry had built a based on the avoidance of having to change trains, but had failed to realise (a) how weak that business was, and (b) how segmented it was. The XC market appealed in the main to those who had time on their hands or had heavy luggage; students, nurses and pensioners may be highish volume traffic but are generally impoverished. The lucrative commuters and businessmen would invariably prefer something faster. There are some interesting comparisons with the former GreenLine network in the days before congestion ruined its timetables. There is some anecdotal evidence that in those days, there was a significant market generated by simplicity and being able to provide a personal touch (sc conductors) to help the unfamiliar). NBC used to claim this was also true for the national coaching market as well with the added bonus of the driver unloading your luggage. More generally, there are slightly uncomfortable lessons for a regional express network as a major investment target, The NSE TLK plan would probably have been worthwhile financially and in terms of vfm because it was propped up by the Brightons (and also because it was built up from existing services) but even then, some of the more ambitious twigs would have suffered in the same way as Basingstoke-Ipswich route. @Graham H – are you counting nurses as having time on their hands, or heavy luggage ? Please answer carefully – I’m married to one. @Jim R Neither! They were then – and probably now even more so – short of cash and therefore tended to select the cheapest options for travel, which certainly tried to avoid, amongst other things, Cross-London travel… (Again, National Express used to tell us that nurses made up a significant portion of their market for that reason). BTW, yes, my great aunt used to be a nurse, subsequently a matron but that was a very long time ago. Wouldn’t a Waterloo to London Bridge connection be heavily used these days? There are huge PwC and EY offices there, to name but two likely sources of SW commuters. A lower level concourse seems to be in the works at Waterloo, as part of opening the arches under the international terminal. And the rail bridge is still there, although in use for Boris Bike storage I believe. Much too late for such a radical change but it does give an idea of what would have been possible with more imagination (or really, money). Waterloo stands out today as every other major station has improvements planned to add new connections. You have the fundamental problem that you have only two tracks to Charing Cross just west of London Bridge through Borough Market. These are already used for 28tph which is almost the maximum you can squeeze through. Unfortunately, Charing Cross is also a very popular destination so any such scheme requires considerable infrastructure change to increase capacity between London Bridge and Waterloo East. I do not envisage a further two tracks at Borough Market going down well. And what when you get to London Bridge? It is not as if they have half-used platforms there just crying out for extra services. Although a direct connection between the two stations would be nice for some, it is not as if the Waterloo – London Bridge route is badly served. 28tph in the peak hours from Waterloo East. This is the best it has ever had as previously some (or a lot) of trains did not stop at London Bridge. On your last point, I think you have rather overlooked something. The stop before Waterloo is Clapham Junction which will be served by Crossrail 2. Arguably more sensible to intercept before you get to the terminal. And one of the main objectives of Crossrail 2 is to reduce the pressure on Waterloo terminus by taking over some of the suburban services into Waterloo. Bob: Yes. Such a connection might get a fair amount of use from SW commuters travelling to/from offices within walking distance of London Bridge station. But as you clearly realise, the slight improvement for those commuters is not in itself enough to pay for the enormous costs of providing it. The other examples you quote all have many other justifications beyond just speeding up certain commutes. Generally these arise by providing significant extra capacity on overcrowded routes. No need for the subjunctive – there are two such connections (SER and Jubilee Line) and both are heavily used. Only a minority of services into Waterloo could ever be run through a direct connection over the old bridge (which would almost certainly need to be replaced, given that it hasn’t been used for 100 years and in any case was only ever single track), so most people would still have to change anyway. Waterloo as pointed out has not (yet) seen the redevelopment of other termini. The area is improving and could be another riverside opportunity like Vauxhall/Battersea. The cultural quarter is some 60 years old so how many more decades of life are left in those concrete frames. LU interchange is congested and expansion is being provided below track level. The present concourse is narrow yet attractions are still installed like last week’s Tennessee music stage. The air development rights are vast and would pay for a new vastly enlarged retail and concourse above the tracks at the current Balcony level. Even the internal architectural features at concourse level are repeated at Balcony level. By moving the war memorials and meeting clock along with gates and departure board you could even recreate the heritage feel. Escalators along platforms up to the concourse or down to LU would evacuate platforms efficiently compared to current filing to the front of the train. Any future remaining diesel and heritage operations could use the old international platforms left under a ventilated canopy. There is nothing at Waterloo at track level except the old first class carriage portico, the taxi rank, and some bus stands using redundant access lanes. All interchange requires descending to street level. The crucial advantage is that Waterloo and Charing Cross lines are built on the same height viaducts. The front facade as a listed building would not be affected by development, the Portico would even make a nice restaurant. The taxis turn before the link line, the buses can park anywhere. No additional paths are required, Charing X services congested out of that terminal would route through Waterloo – obviously same for Waterloo services passing through LB continuing on the ex-Charing X paths. (Driver training and importing service contagion being overcome in the future). The throat at Waterloo is a constraint on Platform length so expansion onto the concourse is a route to 12 carriage services. The buffer exits would become service access and emergency routes. This Southern Cross type scheme or Terminus redevelopment seems more realistic than another Thameslink or CrossRail2 at an unfunded £32bn. The original Thameslink and Overground projects were based on using existing former trackbeds. When and how Waterloo is changed depends upon whether we have reached peak rail with the 10% fall in season tickets or numbers here head to 150m ppa. Please could any comments on ETA’s proposal be kept brief. Although not described as such, the proposal amounts to closing Charing Cross and diverting all its trains into a through section of a rebuilt Waterloo. Whether this can really be done for £5bn is a matter for some conjecture, as are the benefits. The pre-existence of one single-track bridge is largely irrelevant here, since it is proposed to carry four tracks across the road and through the (listed) front facade. No additional paths in or out of central London would be provided. Waterloo has seen three major redevelopments in the past 25 years – firstly the International terminal, secondly the mezzanine concourse, and most recently the platform extension project. I think an opportunity has been missed to reduce congestion at the barriers, on the concourse, and at the London end of the trains themselves, by adding a second entrance at the “country” end – the platforms now extend almost as far as Westminster Bridge Road. This would have been very convenient, and therefore popular, with both politicians and Whitehall staff. If Lambeth North’s lifts were to be replaced by escalators, the top of such escalators could be quite close to this new entrance to the main station. @timbeau – yes; I never understood what prevented the use of the western end of the undercroft – there is already a public right of way in a tunnel through there – apart from cost and the wish to gate individual platforms. A more rational approach would be the more radical movement of the gate line forward from the buffer stops to allow for more flexible opening arrangements to meet the traffic flow and easier circulation between platforms, especially now the concourse has been largely cleared of clutter. Same approach in a western undercroft entrance. Was on my to-do list had NSE not been abolished. Onwards travel to the NE of Waterloo. Unless it’s absolutely urinating down with rain, large numbers of people simply walk. I know someone whose office is in Cheapside & a lot of her fellows walk from Waterloo. Anyuway, as pointed out, there already exist three options for forward travel: Ex-SE&CR Wat East – London Bridge; Jubilee Line – ditto + Canary Wharf; & the “W&C”. I used to do just that after I discovered the bus was slower than walking (ever since the 76 was diverted from the direct route via Blackfriars Bridge, apparently for the express purpose of getting stuck in the jams on Fleet Street) – but now, along with many others, I use Boris Bikes unless it’s raining, when I walk (through the double-ended stations at Waterloo East, Southwark and Blackfriars, so most of the route is under cover). Despite ETA’s fancy graphics, only a minority of SWML services would be able to use such a link, as they would have to funnel through the two track section at Borough Market. (Unless you are going to use all four tracks on the south side of the triangle, but then all Thameslink services would have to go via the Elephant. And although there may be a significant number of people from Southampton, Surbiton or Shepperton who would like a direct service to London Bridge, there are probably at least as many people in Chartham, Chilham and Chatham who value their direct services to Charing Cross! For some reason, the eta link refuses to work. More generally, Waterloo currently sees something like 60+ tph in the peak, even a 4 track railway would be struggling to handle those volumes, as does the present 6 track railway. So some retention of terminal capacity at Waterloo is inevitable. Also people may have noticed (indeed, I see the evidence of that in other threads on this site), that linking complex services leads to a collapse of reliability; to do this once is a mistake, to do it twice deliberately borders on the insane, redoubled to allow for the complexity of the SW operations and the need to condense 6 tracks’ worth of paths into 4 tracks’ worth with all the weaving that that implies. One might also say, a propos concrete and steel buildings generally, that there is little sign of the earliest of these, now well over a century old, being in a state of collapse. Why would they if properly maintained? The eta scheme seems to be just another version of crayonism , in this case, with the added benefit of being drawn up by someone who seems to be innocent of understanding railway operations. Greg’s (vfm/existence of alternatives) and Timbeau’s (lack of suitably large markets) points show how this is a solution looking for a problem as usual. Just because it was possible for a few troop trains and Edward VII to move across the concourse a long time ago has little relevance to 2018. Air rights development at Waterloo is severely constrained by the lack of solid ground below the station. The amount of space taken up by the tube station and lines leaves little or no space for foundations, except perhaps on the east side. The additional cost of building over railway lines generally makes such development viable only when there are no other opportunities in the area – and there are still various other sites in the Waterloo area awaiting redevelopment. Oh, it is so awful. I can’t believe I even thought of it. A huge amount of services would end up being dumped at Lewisham in an utter nightmare of pathing. I have since placed it in the file under “Don’t Go There”. The eta proposal is so utterly bizarre, and will not solve a thing and inconvenience a great many people who presently use Charing Cross. 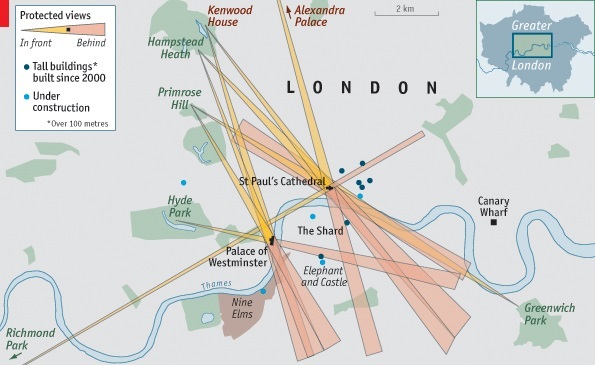 Apart from the points above, it will dump thousands onto the Underground as they struggle to get north of the river. I shall file this under “You Haven’t Thought This Through”. Apologies for the use of crayons, but they were old. They have been since filed under “Emergency Use Only”. The observations were made in the context of cross London connections like original Thameslink. Not advocating any changes just pointing out that there are options. Closing Charing X is pointless as the property redevelopment has already been done but considering capacity limitations has merit. I was not aware of any geological limitations on high rise redevelopment at Southbank but as stated there are potential sites in the neighbourhood. In the wider zone the below ground infrastructure could be accommodated. I attended a meeting at Purcell two weeks ago and confirm nothing is in imminent danger of collapse but the economic life is probably finite, it survives on public subsidy. Not focusing on any one Terminus and there are currently many opportunity sites being advanced around the London network, this one just seemed overlooked. The Fenchurch St – Marylebone chestnut referenced earlier was absorbed by the Metropolitan linking Barking to the joint Central stations to Amersham. Liverpool St – Paddington branches are effectively joined by the Central tube with the main line stoppers now being joined by Crossrail for relief. In terms of urban regeneration providing connections between employment centres and housing opportunity zones there are options that need not include Tottenham Court Road. Angel Road – Stratford & Hounslow OOPD Hendon seem like better value schemes than always chasing a Grand Projet. Looking for London’s housing needs beyond the Green Belt seems like a folly. CR1 only has two stations within the Circle! Even if CR2 goes as far as Stansted (ten stops beyond the GLA boundary), the numbers come out very similar. @Timbeau Thanks for the comment, BRPB practice was to fund transport infrastructure with overdevelopment within the site, but that’s not the only way as other operators manage. LR has published projections with a TL2 and even a CR3 on TfL’s 2050 vision. I guess the Barking Wimbledon route was to relieve Waterloo to LB, if that’s where the Waterloo East footbridge traffic is heading. In London there has been a century of schemes linking terminating services and history is unlikely to slow in the 21st. I guess he means British Railways Property Board but that doesn’t make sense. What I think he was trying to say was that British Railways Board (BRB) practice was to fund major schemes with money from the BRPB using overdevelopment within the site. Also I think he means oversite development not overdevelopment. @PoP: “oversite development” in my books means “site over development”. It constrains what you can do with a station hugely (and also prevents 4 tracking in the case of Earls Court). @timbeau – I should have been more precise – CR2 has no stations in Zone 1 which are at the major traffic objectives (the West End and the City); CR1 has two. @everyone – you all quite misunderstand the way that public finance works. Any money BRPB received reduced the Board’s borrowing requirement; it was not hypothecated to any specific expenditure, infrastructure or otherwise. The Board’s investment programme was determined quite separately and took no account of property receipts. If property receipts went up, the Treasury simnply said “Thank you very much”; they didn’t say “Have a bit more investment”. The whole point of public finance is that there is no relationship between receipts and expenditure except at a national level across all sectors. All the arguments in the annual PES rounds are about spend, therefore, and only very rarely about receipts from any source. This is the result of the abolition of separate Exchequers in about 1702. All (state & other) assets are expected to be used efficiently. The redevelopments at stations incorporated improvements or at least renovations. Isn’t Tottenham Court Road in the West End? And which of Liverpool St/Moorgate and Farringdon you consider not to be in the City? In any case, new rail links are all about connectivity, which is why CR2 is proposed to call at Tottenham Court Road rather than, say, Piccadilly Circus. Don’t. We have been through this argument before – and last time it was between you and Graham H. It is completely fatuous as it depends on what people consider to be the West End – for which there is no definitive boundary. Banned. why CR2 is proposed to call at Tottenham Court Road rather than, say, Piccadilly Circus. One. Because passive provision had already been made. Two. Because the cost of land around Piccadilly Circus is sky high. Three. Because listed buildings would be a great challenge. Four. Because it was established years ago that although you could fit a conventional tube station in between the current tunnels, you could not fit a Crossrail station in without going very deep indeed – which brings its own problems. Five. Because it is unnecessary with an entrance to Tottenham Court Road (Crossrail 2) on Shaftesbury Avenue*. All been discussed many times. * which, dare I say, is probably accepted by most as in the West End. Returning, briefly, to the subject of station development and paying for station upgrades, I suspect some contributors here approach it from the LT rather than the BR perspective. The two organisations asked different questions, and this was reflected in the divergent appraisal systems. LT asked: What is justifiable ? – and then – is there any property income that we can use in the process , and how do we fit in such a programme within the overall expenditure cap. Station appraisal was fully integrated with other investment targets and handled accordingly. But you knew that. With BR, the whole process was the other way round. The question was “How much can be raised from property sales – and only then was it asked what the minimum expenditure on the railway side of the business might be, and the appraisal and financial aspects of those two questions had quite separate lives. The gross property receipts were set off against the PSBR, the railway costs were met by a mixture of cash and borrowing. There was (a) no netting off of one against the other, and (b) whatever was bought by the operational railway tended to be sufficiently innocuous not to attract the attention of Whitehall but in general, the barest minimum. Indeed, the answer to the minimum requirement was sometimes “None” – Broad Street (Marylebone and Paddington were escapees). There was no programme of station upgrades (other than NSE’s Total Route Modernisation programme, which sneaked in a few redecoration cases), and those stations which were rebuilt were all done to minimum cost as the price for releasing the air rights. Many results were poor and shoddy – Charing Cross for example – even where property receipts might have promised something bigger. The difference between the LT and the BR approaches to investment triggered a major internal row in DTp after LT was renationalised, which was eventually (not) resolved by commissioning appraisers from each organisation to consider the two appraisal methodologies. Stations turned out to be a major area of difference, as expected – Palmer, the then DS/Transport Industries, was specifically gunning for the LU station upgrade programme – but as the LU appraisal system was comprehensive, even he realised that he couldn’t attack stations without bringing down the whole LU appraisal system, with the obvious dire consequences for services. Graham: Although it has obvious disadvantages for transport, I can entirely see the logic of the BR approach. Having been nationalised, the railway is part of the nation’s property, and any “windfall” gains arising from it should be applied where the nation will best benefit. If that is decided to be hospitals, or bread and circuses, rather than better train services, the all-wise (*) government should be able to send the money in such directions. @Malcolm – absolutely. Running the economy and tax system on socio-economic concepts as GVA was totally alien to the Treasury and in large measure, still is. As I have remarked before, their relationship to cash is as blotting paper to ink. In that, they are no different to most other western governments (although I discovered the Swiss have an additional bugbear in relation to the security of government bonds – but let it pass). re Treasury approach to property receipts, isn’t this what is stopping (or has stopped?) an integrated redevelopment of Euston station as HMT will not ‘allow’ property receipts from over site development to be used to pay for the NR station to be upgraded at the same time as the new HS2 station(s) is built (in phases). @A-mous – indeed. There is a further – and specious – Treasury argument, that I forgot to mention and that is that each investment project should be considered on its “own” merits, and not as the net outcome of some other project. That view is the death knell of public enterprise, of course. At the risk of the wrath of the moderators, would you mind elaborating on why the ‘DS/Transport Industries’ didn’t approve of LU station upgrades? (facilitated by the previous Mayor) without putting the proceeds towards transport improvements. @IanJ – happens all the time – I was amused/unsurprised when I heard that the first thing that happened when NR was reclassified as public sector was that they had had to embark ona large scale programme of property disposal. Unfortunately for all concerned, BRPB had been rather good at screwing large sums out of the portfolio, and Railtrack had been nearly as busy with what was left, so NR is down to some of the smaller/more tricky schemes, such as East Croydon or Clapham (probably amongst the biggest left, now that Reading escaped before renationalisation). @Herned -as the gentleman in question is still alive, I have no wish to provoke a suit for slander. To put it neutrally, he believed fervently in very small government, thought that taxpayers’ money spent was being wasted, especially when it was being spent in London, and that nationalised industries were unnecessary. These guiding principles, on which he lectured us daily, manifested themselves in certain specific policies including a declared wish to close Regional Railways (and NSE in great measure) and led to appalling, permanent, and occasionally violent conflicts between himself and both ministers and other officials. In answer to the next question you haven’t asked yet, I don’t know – Permanent Secretaries seemed afraid to tackle the issue, and the last of these to manage him, Sir Alan Bailey, at his (Bailey’s) farewell party, Bailey pretty well apologised to senior staff present for failing to deal with it. Thanks for the tactfully worded response, and to the obvious follow-up question… which begs the further question: My understanding is that the role of the Civil Service was broadly to facilitate the implementation of the elected government’s policies – so surely the hierarchy is Minister>Permanent Secretary>Everyone else. And therefore what the Minister says goes? (e.g. replacement of pacers was noted as being against Civil Service advice). On what grounds did the gentleman in question believe he had the authority to argue so vehemently , as opposed to offering advice? Or am I being stupidly naive? I can’t beleve you would ask that question if you had ever seen “Yes, Minister”. I’ve very proudly got the hardback version of “Yes, Prime Minister: The Diaries of the Right Hon. James Hacker”. Given the concurrency of the originals to the questions you are asking, I would suggest watching/listening/reading these is a great use of you time. You have set out, nicely, the principle by which government (whether central or local) is managed. However, the reality is different on the basis that, first, there are far more decisions to be made than a Minister (or group of ministers) can sensibly make. These leads to delegation to officials who will bring their own knowledge and experience to the issues as well as acting in line with government policy – as the latter is often either contradictory or even missing this gives officials considerable scope for pursuing their own beliefs. Where delegation is formally managed this is difficult enough, but Ministers have a great tendency to cherry pick issues where they have become the issue of the day, even where these decisions have been delegated. Second, where the decisions are inherently more technical than many Ministers’ knowledge, they rely on officials’ interpretation of technical issues. Sometimes this can be actually wrong (one DfT Minister was told that benzene was not toxic as a reason for refusing a rail freight grant and repeated this in Parliament ), but more generally gives officials even further scope to pursue what they think is right. Briantist draws Herned’s (and others’) attention to “Yes Minister”. While entirely supporting this pointer – it was a wonderful programme – a caveat should be issued that it was written as fiction. Many people have said that it came unnervingly close to representing the minister/civil servant relationship accurately, and its writers must have had good access to well-informed sources. At the same time, what it did not reflect (and was not designed to reflect) was the theoretical intended relationship, of which all civil servants are aware, whether or not they adopt it in practice. In that theoretical set-up, civil servants are supposed to use all of their own factual knowledge, but entirely suppress their own opinions. (Among many difficulties with this model is the blurred line between factual knowledge and opinion, of course). Yes, I am fully aware of Yes Minister, and the realism which those in the know claim it.. the way that showed the process of giving advice and even the Civil Service getting their own way was via gentle nudging, explaining the potential downsides and pitfalls etc. The difference between that and the situation described by Graham H is what I was surprised by. Thanks for adding some meat to the bone as it were..
* As in “If I might make a Sir Humphreyish point, Secretary of State ….” Minister giggles. So far as possible use of the Air rights over Waterloo station I suspect that going high will block some of the ‘protected views’ of St Pauls. I think I wrote that many years ago from memory back in the days when Wikipedia used less referencing and when it was harder to check this stuff online. I remembered the changes from Guildford to West Croydon to Sutton loop from my school days as someone who lived in Epsom and went to the City of London School (by Blackfriars) in the 1990s but didn’t make exact notes of which year which change happened. I was unaware of any earlier ventures on that route and probably expected someone to fix that eventually. As another potential user of the service back in the mid 1990s (especially when it ran to Epsom and thus provided a direct link to school), I just never used Thameslink for the school commute because the timetable and journey time were utterly impractical. (It did get used for the occasional Saturday journey into London but this was when the only other services from Epsom were half hourly and I always seemed to arrive at the station just in time to get the full platform experience.) If the rejig to the Sutton loop offered any benefits from changing at Sutton or Wimbledon I will be honest in never noticing them (for one thing back then it was extremely hard to get hold of timetables for TOCs that didn’t manage the local stations). I have a recollection that before the 1978 timetable change there were trains to the Wimbledon Loop from Holborn Viaduct. They were, I think, London Bridge – Wimbledon – Sutton – West Croydon – Norbury – Holborn Viaduct. Or some such convoluted route. There were also London Bridge – London Bridge services by way of the now closed spur between Norwood Junction and Selhurst. By the time I was commuting between Herne Hill and Holborn Viaduct in the early 80s, I think West Croydon was the advertised destination – they may still have continued to Wimbledon after that. No doubt this map has been brought up before, but it shows the Wimbledon loop services in the late 60s. The Lambeth Development Plan linked earlier was interesting, now 5 years old so likely to be updated in another 5. Ambition emphasises preservation of much that is there with renewals. All concourse provision is aimed at the undercroft arches and street level. The elevated walkway network is at the railway level. Any access to the North side of the site is proposed at street level under the Charing X line. No discussion of any balcony level concourse extension or platform bridging. @Timbeau I’ve seen a map somewhere from the late 1980s that shows the Wimbledon trains terminating at West Croydon and can definitely recall seeing the trains at Wimbledon in 1995. South West Trains subsequently ran a shuttle from Epsom to West Croydon (later extended to Guildford) which terminated & reversed on the through platform 3 and I’ve long assumed this was taking over slots & an operating practice that had previously been used for the Wimbledon line rather than the old ones being a London to London service. The 1970 timetable shows the Wimbledon loop service mostly as Holborn Viaduct – Wimbledon – Sutton – West Croydon – Forest Hill – London Bridge. I think the afternoon variation was connected with distribution of parcels traffic and evening newspapers. The trains may not have really terminated at west Croydon but morphed into West Croydon – London Bridge services – Just as St Albans – Sutton services via one side of the loop become Sutton – St Albans service via the other side. @timbeau: the map shows Welwyn to Dunstable North, which closed in 1965, but not Dunstable to Leighton Buzzzard, which I think closed in 1962. The presence of the double arrow logo means it has to be 1965 – perhaps created as part of the overall rebrand of BR in January 1965, or to mark the creation of Greater London in April? I hadn’t spotted the Dunstable line! The map extends a long way outside the area governed by the Greater London Council/Authority, so it seems unlikely that it is specifically linked to the creation of the GLC. The BR rebranding seems more likely. It can’t be a map issued with the All Britain timetable, because they did not exist until 1974 – before that each Region issued its own. It turns out that LURS have an account from Ted Relton, who as part of the London & Home Counties Electric Traction Society encouraged BR to produce the map – issued 1 April 1965. And the LHCETS were particularly keen to encourage the restoration of services on… the Snow Hill Line. An intersting article, although I think there is a mixing of causality at oine point. Roller blinds had been introduced on EP stock (and even some 4SUBs) several years before the Hastings units, but the multiples of 11 could not be used because a stencil-fitted emu could still turn up anywhere on the electrified network. The Hastings line (and other non-electrifed routes used by demus, such as the Solent area, and the East Grinstead and Uckfield lines) could use these numbers because no emu could go there (and because no e.m.u fitted the restricted loading gauge on the Hastings line).